No matter how well a plant is designed and operated, there is the potential for accidents to happen. Accidents can be as minor as small spills or releases to major incidents that require evacuation, personal injury or death. Plans must be in place for all possible situations and personnel should be trained so they now how to react to minimize the impact of an accident. The following are accidents, both minor and major that have involved sulphuric acid plants or sulphuric acid. Motorists approaching the John Pandeni Research Station south of Grootfontein are cautioned not to stop at an accident scene. This warning was issued by Otjozondjupa Police spokesperson, inspector Maureen Mbeha. 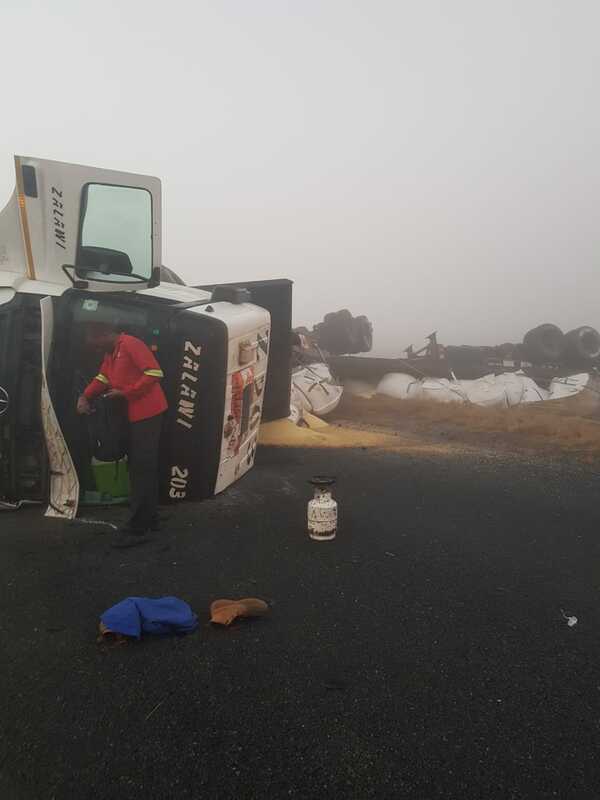 Mbeha says a truck carrying sulphuric acid, en route to Zambia from the Erongo Region, overturned there at around 09h00 on Tuesday. Emergency teams made up of police officers and mining experts are on the scene. Motorists are urged not to open their windows as the acid is highly dangerous and can cause blindness. The truck driver, whose identity has not yet been confirmed, has been transported to Grootfontein State Hospital for medical examination. Mbeha says he is in a stable condition. A ZAMBIA-bound haulage truck transporting 30 000 litres of sulphuric acid was involved in an accident spilling the hazardous liquid near Northlea High School in Bulawayo’s Richmond suburb. The Environmental Management Agency (EMA) cordoned off the accident scene due to the dangers associated with sulphuric acid. 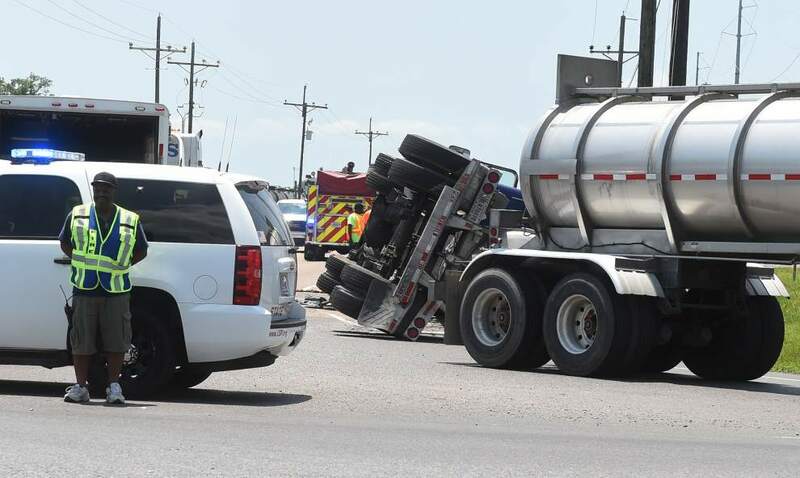 Bulawayo deputy police spokesperson Inspector Abednico Ncube said the accident occurred on Sunday after the truck driver failed to recognise a T-junction connecting the Bulawayo-Victoria Falls Road to Masotsha Road resulting in his truck overturning. Mr Ndlovu said the city was lucky not to receive rains when the accident occurred as the acid could have swept into storm drains contaminating water which could have spelt doom for the environment and its surroundings. He said the company which was transporting the sulphuric acid has as per the law, agreed to foot the bill to clean up and disinfect the affected area. A tractor-trailer that slid off a road last Friday in Oregon Basin leaked a minor amount of molten sulfur but no toxic gases. The Park County Sheriff’s Office responded to the accident along with the Cody Volunteer Fire Department and Cody Regional Health ambulance. At 10:14 a.m. dispatch received a report of a tractor-trailer combination that slid off the road and was on its side in Oregon Basin at 238 Road 3EM. The caller said the trailer contained molten sulfur and it was possibly leaking. The road conditions were hard-packed snow that had turned to ice. The truck driver appeared to have tried to veer right around a slight curve in the road while going down a slight grade and lost control going straight instead, according to the sheriff’s office. Once it left the roadway, it turned on its side with the trailer containing the sulfur nearly upside down. A Marathon Oil employee certified to check chemical spills donned his hazardous material suit and went down to the truck to check for traces of toxic gases. He returned and said there was none present, but there was in fact a minor leak of the molten sulfur coming from the trailer. A truck transporting acid to a mine owned by Glencore in the Congo has killed around 20 people after colliding with two minivans. The truck carrying sulphuric acid crashed with the vehicles around 31 miles from the Mutanda copper and cobalt mine in the Democratic Republic of Congo at 6pm on Wednesday evening, a spokesperson for Glencore said. The truck belonged to a logistics company contracted by the mine, the company said. “The acid was sprayed over people and vehicles,” Jean-Marie Tshizainga, mines minister for the Lualaba province told Bloomberg. “Our condolences go to the families and friends of those that have been impacted by this devastating event. [Mutanda Mining] will continue to work with the logistics company and relevant government agencies, including the emergency services to provide support to them and to the local communities” Glencore said. A recent fire at Port Moody's Pacific Coast Terminals that sent four workers to hospital has the union representing employees raising concerns over the company's safety protocols. Jerry Yamamoto, a member of the International Longshore and Warehouse Union executive, said PCT is not following federal regulations when it comes to workplace safety and incident reporting. "Upon initial investigation, we found immediately they're not compliant in many areas," he told The Tri-City News this week. Port Moody Fire Department confirmed a blaze occurred Jan. 9 while contractors were doing welding work inside the sulphur train dumper. According to Local 500, four people were taken to hospital and one has not been able to return to work. Yamamoto said when the incident occurred, there was no emergency callout to workers, staff or the fire department until one of the affected workers dialled 911. Even more concerning, he said, is that he has since learned of two other fires on the waterfront site that were not reported to the union's safety committee. The lack of transparency is problematic, he added, because assessing incidents, even if they are minor, helps ensure that they do not occur again. "That is the whole purpose for the language behind occupational safety," he said. "Those documents are all meant to be preventative measures." Yamamoto said he has concerns over how large the fire could have grown if a worker hadn't dialled 911. "The potential there isn't being taken seriously," he said, noting sulphur dust is rated as a combustible material. "What were to happen if no one was in the dumper itself and we had a fire? At what point would we have notification? How severe a level?" Last month, PCT celebrated having the best safety record of all terminals in Port Metro Vancouver. According to the company, it has not had a lost-time accident for 1,519 days (more than four years) in the company's maintenance division and it has been more than six years since employee time was lost due to a safety incident. "We are proud to celebrate the professionalism and commitment of our staff in ensuring the safest and healthiest workplace," former vice-president and general manager Ken Catton said in a news release at the time. But Yamamoto said lost-time incidents are the wrong statistic to be using for basing safety recognition. In a statement to The Tri-City News, PCT said during last month's fire the company halted operations and evacuated personnel immediately. The company wrote in a statement that the fire was extinguished within an hour and the workers were sent to hospital "as a precautionary measure" and discharged within 24 hours. "These types of incidents are very unfortunate and we're deeply concerned when any of our personnel are affected," the statement said. "We have a strong culture of safety at PCT, including extensive procedures and specialized equipment that help us to prevent and respond to incidents." The company said it would be reviewing the Jan. 9 incident with the joint safety committee, which includes representatives from Local 500. But in a response to follow up questions, Andre Olivier, PCT's vice-president and general manager, acknowledged that another fire occurred in the sulphur train dumper last August that was not brought to the union's attention. He said while workers were unloading a train, "smoke was observed in the sulphur dumper for approximately 20 seconds. Work was halted and water was applied and when no further smoke was observed operations resumed." Because the incident was deemed minor, it was "not discussed at the joint safety committee, as there was not assessed risk to worker safety stemming from that incident." Port Moody Fire Department told The Tri-City News it has protocols in place for dealing with emergencies at PCT. Deputy Fire Chief Jason Harper said firefighters have worked with the company to ensure fires are extinguished on the site quickly. "Our department has worked very closely with PCT and understanding the hazards of their site and how our best approach is when we have different kinds of emergency incidents," he said. "Our response to fire incidents are similar with all industry as we have to ensure the safety of our personnel before we can actively commit to fighting any fire." 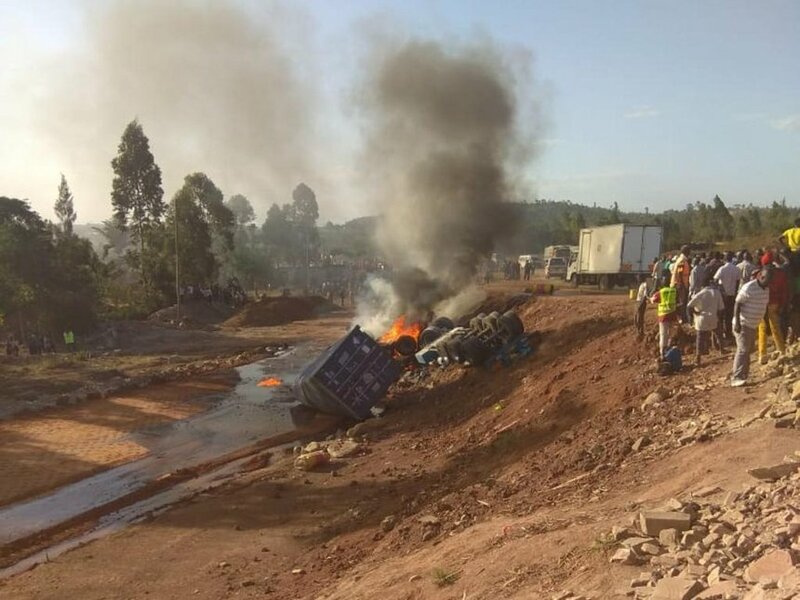 Two people were killed on Monday evening when a truck transporting sulphuric acid crashed and burst into flames on the Eldoret-Webuye road at the Kaburengo interchange. The driver and his turnboy were burnt beyond recognition, despite attempts by the emergency services including St John Ambulance responders and firefighters to put out the flames. The incident adds to 16 the total number of people who have died at the blackspot since last month. On December 21 last year, 12 people died on the same spot after a fuel tanker crashed into a matatu and burst into flames. Over the weekend, two other people were burnt beyond recognition in an explosion which involved four vehicles, including a fuel tanker. 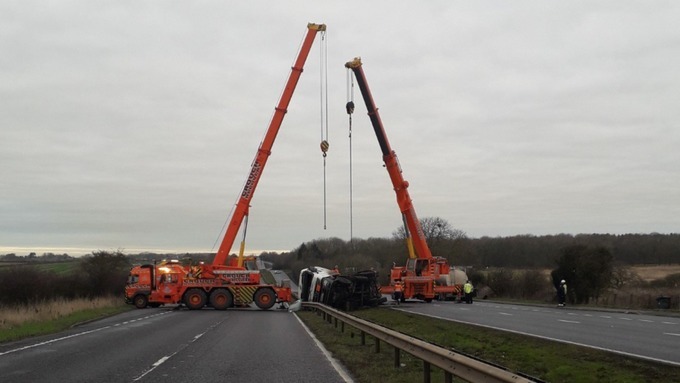 The A1 near Stamford was closed for nearly 12 hours on Friday after a tanker carrying more than 20 tonnes of sulphuric acid overturned. The incident happened just after 5am. Police said the lorry was found on its side, but luckily no acid leaked onto the road. Specialist teams spent much of the day trying to move the vehicle, and the road eventually reopened in both directions shortly before 5pm. “There are no injuries to the driver as far as I am aware," Mark Gee from Lincolnshire Police said. "The driver was trapped initially but managed to get himself out." Norfolk Southern is reporting 6,000 to 8,000 gallons of molten sulfur leaked in Tuesday's train derailment in Blounts Creek. Initially, Norfolk Southern told 9 On Your Side 1,000 gallons spilled, before updating to the higher number shortly after. 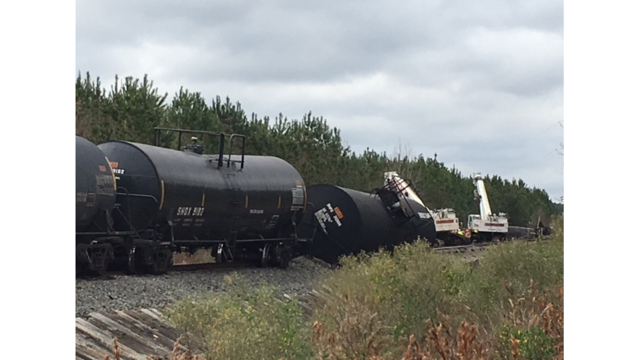 In an emailed statement, Norfolk Southern's public relations director Susan Terpay said: "twelve rail cars carrying molten sulfur derailed when a CSX train derailed early (Tuesday) morning. The 97- car CSX train was operating over Norfolk Southern tracks. An estimated 6,000 to 8,000 gallons of molten sulfur were released. Molten sulfur is transported as a liquid but cools rapidly and solidifies. Norfolk Southern will complete environmental remediation operations, which will involve removing the hardened sulfur from the soil and replacing with new soil. The product in the remaining cars will be transferred to other rail cars." Norfolk Southern said the hardened substance, elemental sulfur, does not post the same risk as when it is in molten form. 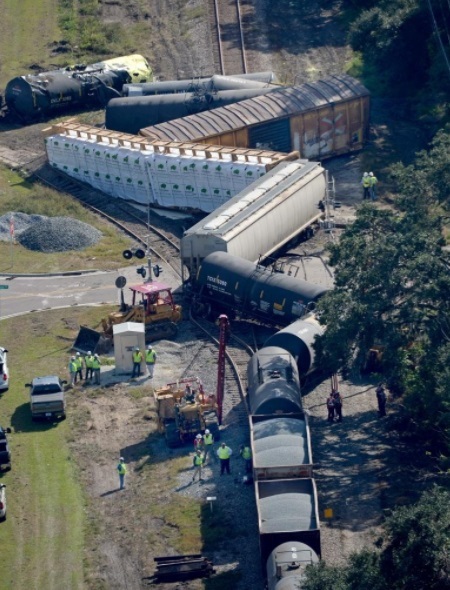 The company is coordinating with the North Carolina Department of Environment Quality to remove the damaged tank cars. On Wednesday, 9 On Your Side captured crews repairing the tracks and spoke with a resident who lives on Stilley Station Road. "I really don't have any concerns," said Olive Jones. "We've even rode our bicycles about two miles down the road, and we really haven't smelled anything. I know they are doing their best." Norfolk Southern said its emergency response contractor monitored the site for the release of hydrogen sulfide but didn't find any. USA No one was seriously hurt after a truck hauling sulfur apparently collided with a vehicle and overturned in Wimauma Saturday, officials said. The incident occurred on Highway 672 at Ayersworth Glen Blvd. The Hillsborough County Sheriff's Office said the driver of the car suffered non-life threatening injuries. No other injuries were reported. The agency did not say how the crash was caused. Ayersworth Glen Blvd will remain closed for at least three hours as a hazmat team works to clean up sulfur, authorities said. Emergency responders from Soda Springs to Pocatello are dealing with numerous sulfuric acid spills left by a lawn service truck on Thursday evening. 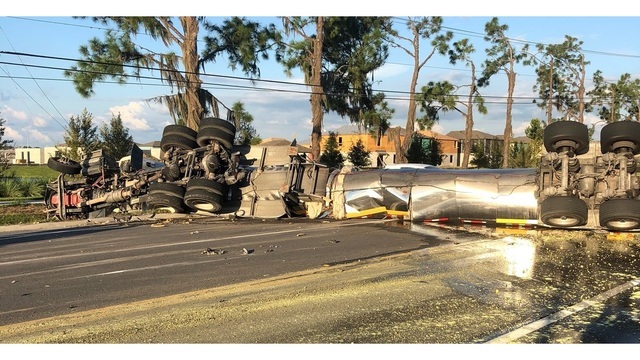 The sulfuric acid leaking from the vehicle injured the man driving the truck and authorities are urging area residents to use extreme caution if they encounter the highly dangerous liquid. Police are advising any motorists who have driven through the puddles of sulfuric acid on area roads to immediately wash their vehicles with soap and water. Sulfuric acid can cause serious burns on people but it can also severely damage cars, especially their tires. If you get any sulfuric acid on your skin, please seek immediate medical attention at the nearest hospital, police said. Authorities said the lawn service truck began leaking sulfuric acid in Soda Springs and continued doing so as it traveled on Highway 30 to Lava Hot Springs. The vehicle stopped at the Sinclair convenience store in Lava Hot Springs, leaving behind a very hazardous puddle of the liquid acid. The truck continued leaking the acid as it traveled on Highway 30 to McCammon and then onto Old Highway 91 to Inkom and then Pocatello. The driver, whose name hasn't yet been released, noticed that his truck was leaking the acid at Old Highway 91 and Fort Hall Mine Road but he continued to travel into Pocatello nonetheless, authorities said. His route through the city went from Fort Hall Mine Road to Portneuf Road, Bannock Highway, Main Street, Gould Street and then McKinley Avenue. At this point Pocatello police began receiving reports about the leaking truck and an officer caught up with the vehicle in the 700 block of McKinley around 7:15 p.m. Thursday. Police said the driver was trying to stop the leak, suffering burns in the process, when approached by the officer. Police said the driver was not hospitalized for his burns but was treated at a local doctor's office. Authorities said emergency responders including the Pocatello Fire Department expect to have all of the acid spills cleaned up before the Friday morning rush hour. It's estimated that several dozen gallons of the acid leaked from the truck onto area roads. But police said they doubt if the acid seriously damaged any of the thoroughfares. Police said their bigger concern is the acid's potential to injure people and damage vehicles. Authorities said there are not enough police and firefighters to close down the roads impacted by the acid spills but emergency personnel are stationed on many of the impacted roads warning motorists about the situation. When asked if there will be any repercussions for the lawn service truck's driver because of the acid spills, Pocatello police said the entire incident remains under investigation. Explosion September 25, 2018 Arab, Alabama One person was killed today in an explosion at a chemical plant in Arab, authorities said.The explosion happened before 2 p.m. at Umicore Specialty Chemicals, 1951 Guntersville Road.No other injuries were reported. Arab Fire Chief Ricky Phillips said there isn't any ongoing danger to the community or any type of chemical release.Authorities don't yet know what caused the explosion.Phillips said several people were working on a 7,000-gallon tank when the explosion happened. The tank, which previously held sulfuric acid, has been cleaned and deemed safe, the chief said.The Occupational Safety and Health Administration has been contacted to take over the investigation.The fatality victim worked for a contractor -- not the plant, Phillips said. Emergency personnel were trying to recover the body and contact the victim's family.Arab police and the Marshall County sheriff also were on scene. A spokeswoman said the Marshall County Coroner's Office has been called to the scene.Will Kennamer, a spokesman for the Marshall County Emergency Management Authority, said his agency is aware of the situation. "We are not needed for on-scene involvement at this time," Kennamer said. Two haulage trucks caught fire and one of them spilled an unknown amount of sulphuric acid when they were involved in a head-on collision in Dinde area outside Hwange town on Monday night. The acid tanker was driving towards Hwange while the other one which was going towards Bulawayo was carrying coal and both their hoses were reduced to shells. Police confirmed the accident which left drivers of both trucks injured while the Environmental Management Agency (EMA) quickly moved in and cordoned off the area to prevent a possible health hazard as the acid can cause harm to humans, wildlife, vegetation as well as aquatic life. The Officer Commanding Hwange district, Chief Superintendent Newton Mutomba, said investigations are in progress. "It was a head-on collision after one of the trucks encroached onto the lane of the other and both vehicles caught fire," said Chief Supt Mutomba. On approaching a curve at the 305km peg, one of the trucks encroached into the lane of the other resulting in the head-on collision. Both trucks caught fire immediately and the drivers, Mr Abdiwahid who is Zambian and Mr Darlington Machadu, a Zimbabwean, were injured in the process, police said. The drivers were rushed to Hwange Colliery Hospital where they were admitted. One truck is Zambian registered while the other has a local registration. Yesterday morning firefighters were still trying to put out the fire from the coal. EMA officers were collecting acid which was still spilling from the tank. They dug a trench so it could not flow downstream and affect plant life and contaminate water bodies. EMA Matabeleland North manager, Mrs Chipo Mpofu-Zuze, said precautions were being taken to make sure the acid does not damage the environment. She said the scene had been cordoned off while all the contaminated soil will be removed. "The first step will be unhooking the trailer and then digging trenches so that none of the acid will flow away. Then the rehabilitation process will start whereby we will dig up the affected area and take the soil which will be put somewhere where it will be de-toxicated and tested to make sure it's no longer acidic," Mrs Mpofu-Zuze said. She said EMA officers will guard the scene until the rehabilitation process, which will involve bringing in fresh soil from elsewhere, is completed. Mrs Mpofu-Zuze said said the acid may be dangerous to plant and animals including water life. 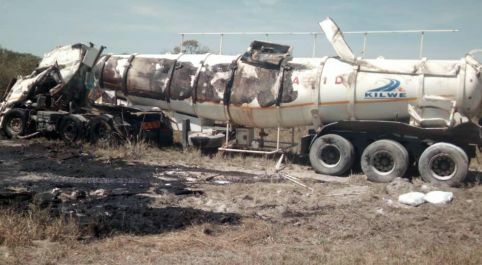 Last year, a Zambian registered haulage truck spilt 34 000 litres of sulphuric acid near the same spot after the driver lost control at a curve and the truck landed on its side resulting in the lid of the tank bursting and the contents spilling. Some villagers reportedly used containers to collect the liquid thinking it was oil. New Zealand An equipment failure caused 400kg of liquid sulphur used in fertiliser mix to spill off a moving tanker from Ruakākā to Whangārei. The spill happened about 6.30pm on Thursday when a 24-ton tanker was transporting the pure sulphur over 41km from the Marsden Pt Oil Refinery to Ballance yard on Port Rd. Whangārei police and firefighters helped Ballance staff clean up the worst of the spill along the intersection of State Highway 1 and Rewa Rewa Rd on Thursday evening while the rest will wash off by itself. The Northland Regional Council is investigating the spill and had not made a decision by edition time last night on what, if any, enforcement action it would take. Spilled liquid sulphur on the road leading up to the main gate at Ballance on Port Rd in Whangarei. Ballance site manager in Whangārei, Mark Adams, said the spill was really disappointing as it was the first time it has happened in the 32 years the company has been transporting pure sulphur from the refinery. Liquid sulphur is a by-product of the refinery used by Ballance in fertiliser mixes. Adams assured the public the bright yellow product was pretty benign and that motorists should simply wash it off if the sulphur came into contact with their vehicles. "The welding in the tank had failed but it shouldn't have leaked as the tank is welded pretty well. A hole the size of the little finger developed in one of the welds that connects to the trailer,'' he said. "The driver wasn't able to see at that time of the evening. The spill built up when he stopped at the lights by Harvey Norman and that's where we cleaned up as much as we could on Thursday evening." Adams said the leak started at the intersection of Port Marsden Highway and SH1, not from the refinery itself. "It was one those things that happened as a result of equipment failure. That was an eight-year-old tank and we've taken it off the road and will look into it. We've had over 50,000 loads in the last 32 years and we've never had this problem," he said. NRC group manager regulator services Colin Dall said the council was notified of the sulphur spill by a Ballance staff on Friday. Regional council staff inspected sections of the road affected by the spill and observed some residual sulphur on the road. Any adverse environmental effects from the residual sulphur are considered to be minor, he said. NZ Transport Agency Northland system manager Jacqui Hori-Hoult said the sulphur was non-toxic. "We swept the road and employed Hydrotech to waterblast and watercut the solid sulphur from the road surface particularly at the intersections where the truck had stopped, allowing a build-up of the sulphur to occur." Part of the A14 is closed due to an enormous acid spillage between junctions 15 and 17. Cambridgeshire police were called to the scene shortly before 7am to reports of a lorry leaking sulphuric acid. A spokesman for Fire and Rescue reports around 800 litres of the chemical substance was spilled onto the carriageway. All lanes have no reopened, but some delays are still expected. A spokeswoman for Cambridgeshire Constabulary said: "We were called at 6.57am by the fire service to reports of a lorry leaking sulphuric acid on the A14, Catworth, EBC." "The fire service are at the scene dealing with the spillage and the Environment Agency have been informed. It is unclear at this time if the road is damaged." A spokesman for Cambridgeshire Fire and Rescue said: "At 6.50am crews were called to an incident on the A14. "Crews from St Neots, Stanground, Huntingdon and Kettering in Northamptonshire attended the scene. "Firefighters arrived to find a lorry containing around 1,000 litres of a chemical substance in a layby on the eastbound carriageway near Catworth. "The tank containing the chemical was leaking, with around 800 litres of the chemical having spilled onto the carriageway. "Working with the environment agency, the crews diluted the chemical substance using water and cleared it from the road. The crews have now left the scene of the incident. The layby and one lane is currently closed." Spill July 2, 2018 India A tanker carrying concentrated sulphuric acid from Kakinada to Chennai Port was overturned near Kaza toll plaza under Mangalagiri mandal of Guntur district on Sunday. In the incident, the driver of the tanker sustained minor injuries. According to police, when the tanker reached Mangalagiri, the driver of noticed that brakes of vehicle failed and hit the electric pole. Later the oil tanker overturned, and sulfuric acid started leaking. On receipt of information, the NDRF, fire and police personnel rushed to the spot and diverted the traffic on the highway besides taking precautionary measures to avoid any untoward incident. They pressed cranes to lift the oil tanker. District fire officer V Srinivasa Reddy said they sprayed DCP power and sand to arrest the leakage of concentrated sulfuric acid. “If the sulfuric acid will mix with water, due to chemical reaction, it will convert into heavy smoke and cause health problems,” he said. Fire engines from Mangalagiri and Vijayawada pressed into service to supervise the operation. Regional fire officer S R Murali Mohan said it will take some more time to lift the tanker. There is no threat to health as we have arrested sulfuric acid leakage from the tanker, he said. Guntur Urban SP Ch Vijaya Rao rushed to the spot and informed that they have pressed big cranes and balloons to lift the tanker. Mangalagiri police registered a case. Exposure June 11, 2018 Baton Rouge, LA A sulfuric acid release sent two contractors at an ExxonMobil chemical plant in Louisiana to the hospital. Louisiana Department of Environmental Quality spokesman Greg Langley says the agency wasn't immediately sure what caused the release Monday morning at the Baton Rouge plant. The Advocate reports that in a brief statement, Exxon said three people were treated by first responders, two of whom were taken to a hospital "for further evaluation." No problems were reported outside of the plant facility. Langley says the acid released was a small amount, which was contained onsite. He expects any investigation to be performed by the Occupational Safety and Health Administration. Exxon is anticipated to file a letter with the state within the week to explain how the sulfuric acid was released. South Africa A truck carrying sulphur overtuned near the water reservoirs on the Delmas road this morning, 20 May. The Zalawi truck toppled over at about 5am, spilling its content over the road. According to Mr Sydney Sachse from GTR,most of the road surface is covered with sulphur and oil and cleanup will still take a long time. Canada Several cars of a CN train carrying sulfur derailed near Mayerthorpe on Friday afternoon.A total of fourteen trains derailed on Greencourt Road at approximately 4 p.m.CN said there were no injuries or threat to public safety, and asked the public to stay away from the area of Highway 22 north of Range Road 85 as they removed the cars and product Friday evening.The cause of the derailment is under investigation. Mayerthorpe is approximately 130 kilometres northwest of Edmonton. USA Several county roads near Etter were closed due to a chemical spill this morning. 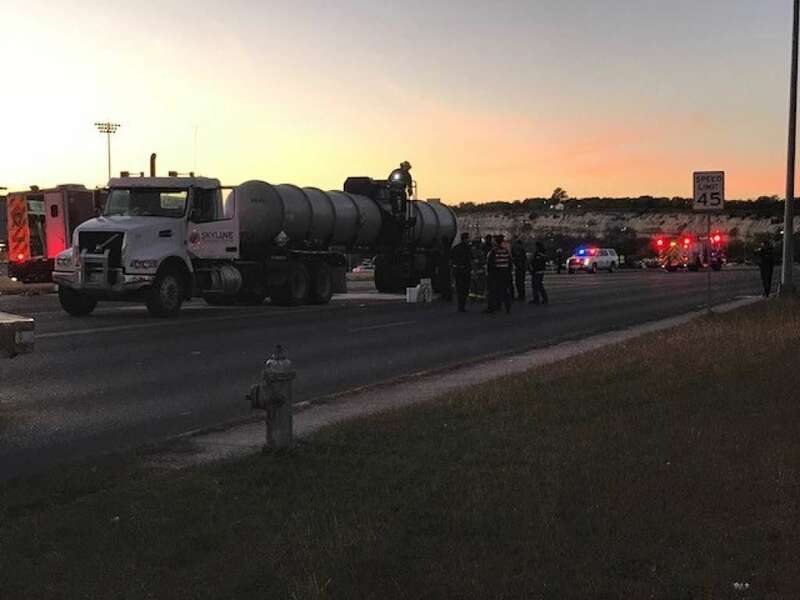 According to officials, a truck spilled 15 to 20 gallons of sulfuric acid while traveling from the Valero refinery to Etter just before 9:15 this morning. Roadways were blocked off until TxDOT and other officials covered the spills with dirt. There was no danger to the public and roadways are back open. The trucking company will remove the dirt and dispose of it properly. Busy Capitol Avenue has finally reopened after being shut down Wednesday for a chemical leak. Deputy Chief Brian Foley said the incident happened at 490 Capitol Ave. on Wednesday morning. According to fire officials, a tank containing sulfuric acid ruptured and spilled inside the building of Capital District Energy Center Cogeneration Associates. "The tank ruptured at a certain level where the possibility of 200 to 300 gallons of sulfuric acid may have escaped the tank and outside retaining walls spilling onto the floor," said Deputy Chief Alvaro Cucuta, Hartford Fire Department. The building was evacuated around 7:30 a.m. and roads in the area were closed. The business itself was running on autopilot. Capitol Avenue was closed between Putnam and Park Terrace for about 12 hours. It finally reopened just before 8 p.m. on Wednesday. Police said the scene was contained indoors, and firefighters said there was no cause for concern to public safety. No runoff and no drains were affected. The road being closed was inconvenient for people who live nearby. "Yeah I had someone pick me up in the morning bring me to the office and now I have to do more, but that's why I'm back," said Fernando Betancourt from Hartford. The owner of a restaurant across the street said it's been bad for business. "A little nervous because we are not sure how long this will take and we’re actually hoping it’ll clear up by the end of the day," said Jamilia Crawford, owner, Fire & Spice Vegan Restaurant. They called the situation "ongoing." 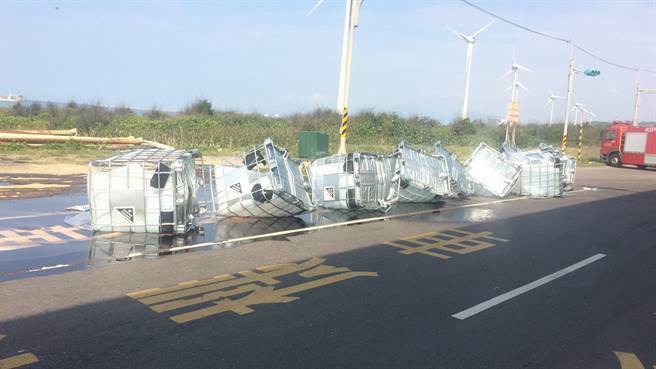 Taiwan A chemical tanker spilled approximately 9 tonnes of sulfuric acid on a road in Taoyuan City this afternoon when 9 out of ten containers fell off as the truck was rounding a corner.The accident happened at the 24 kilometer mark on route 15. The Taoyuan City Fire Bureau dispatched 10 appliances and 26 firefighters to the scene of the accident.Police blocked the road to traffic while the North District Specialized Technical Team For Environmental Accidents was dispatched from the Environmental Protection Administration to deal with the cleanup.A spokesperson for the fire bureau said that as the accident occurred in an open area, there is no immediate danger. A SOUTH African truck spilled 30 000 litres of hazardous sulphuric acid after the trailer caught fire in unclear circumstances. The incident happened last Thursday evening and the driver escaped unhurt. The truck, whose destination could not be established, belonged to MBS Carriers and was heading to Kazungula border post. Police officer commanding Victoria Falls district, Chief superintendent Jairos Chiwona confirmed the accident. “The truck was being driven by a Harare driver, Rangarirai Muchenisi, along Kazungula Road, approximately 20 kilometres from town. According to the statement he gave, he said it caught fire due to an electrical fault as he suspected,” he said. “After realising that the trailer was alight, he disconnected the horse and that is why he managed to escape unharmed.” Efforts to get a comment from Muchenisi were unfruitful, as his mobile phone went unanswered. A massive decontamination exercise is in progress, with authorities ensuring that the dangerous chemical does not harm humans and wildlife. Environmental Management Authority official, Chipo Zuze, said they were on the ground trying to mop up the acid. Ocean March 5, 2018 NC, USA The U.S. Coast Guard says a cargo ship lost 70 of its 30,000 containers off North Carolina's Outer Banks in 65-mph storm winds and waves up to 30 feet tall.The agency says one of the containers knocked overboard Saturday from the Maersk Shanghai contained nearly 6,000 pounds of sulfuric acid, a chemical commonly used to produce fertilizer. The Virginian-Pilot of Norfolk reports that Coast Guard spokesman Ronald Hodges cites experts in saying the environmental threat appeared minimal because sulfuric acid dissolves in saltwater. Company spokeswoman Katherine Mosquera says the Liberia-flagged ship anchored in Charleston, South Carolina, where officials were assessing the situation.The Coast Guard says it found four of the containers floating offshore. Spill January 12, 2018 Pori, Finland A heavy truck carrying sulphur acid capsized near the town of Pori in western Finland on Friday, local media reported.Several hundred liters of the acid leaked out, fire inspector Tero Jarvela told media. 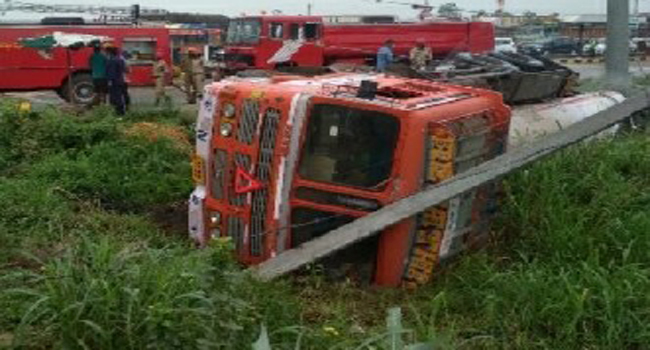 The driver was only lightly injured.The rescue operations were expected to take several hours as the first equipment was to arrive to salvage the remaining cargo.As the acid is dangerous to people, national Highway Two was closed in both directions. No evacuation of people was reported. South Africa Rheinmetall Denel Munition (RDM) has closed a sulphuric acid leak at its Wellington plant and expects to resume full operations shortly, after 300 people were evacuated during the incident. On the morning of 4 January the chemical plant in Wellington experienced a leak in a pipe from a storage tank of highly concentrated sulphuric acid. Police and fire units were dispatched to cordon off the area and direct traffic. According to a statement by the Drakenstein Municipality, 306 people within a three kilometre radius of the RDM facility were evacuated and a two-month-old baby was admitted to Paarl Hospital as a precautionary measure. All families who had to be evacuated from the nearby farms returned home safely. RDM in a statement said that after inspection of the site by Management, the leak was closed on 5 January but the neutralisation process will take another couple of days, but will not cause any further concern to the operation or the adjacent farms around the facility. “Damage to equipment of the factory is limited and will not influence production. Decontamination of the ground is scheduled to be performed immediately once the neutralising action has been finalised. At this stage, RDM does not foresee or anticipate any impact to the environment,” the company said. As the leak could not be closed off immediately due to the danger involved, RDM said it was decided to let the tank drain on its own in a controlled manner, while containing the outflow acid in trenches around the tank farm. “In this way, RDM was able to control the flow. The acid was neutralised with lime, which was dumped on top of the acid into the trenches. When in contact with air, sulphuric acid forms a mist cloud. This was visibly suspended over the site yesterday during the day. Thanks to low wind speeds, the mist had time to evaporate and dissolve over the plant. The situation was safe by late evening.” RDM said that the entire operation was supervised by its on-site Chemical Engineer to ensure safe-handling of the acid spill. “RDM trains special staff for such occurrences to prevent damage to the environment and harm to any person. In the chemical industry, it is of utmost importance to be prepared for such operational mishaps which may occur at any time. We do the utmost to avoid such cases and to ensure safe and controlled operations of our plants,” RDM said. Road December 28, 2017 Louisiana A tanker truck loaded with sulfuric acid caught fire this morning in Mandeville and shut down a portion of North Causeway Blvd. The roadway is now open but delays are lingering. The truck was traveling northbound from the Lake Ponchartrain Causeway Bridge onto the North Causeway Approach when the rear brakes locked up and the fire started. The truck was stopped by a Homeland Security agent in the 1000 block of the North Causeway Approach and first responders were notified. St Tammany Fire District IV arrived quickly and was able to get the fire under control before the tank was compromised.No one was injured in the incident. Later this afternoon another tanker will arive to transfer the sulfuric acid and at that time Northbound Causeway in Mandeville will be shut down. China Tonnes of sulphuric acid leaked from a tank at a chemical factory in central China, Chinese media reported. The leak was detected at about 5.50am on Monday at the state-owned plant in Lingbao in Henan province.About 300 workers sealed off the area around the spillage so the chemical could be treated.There was no contamination of soil, drinking water or the air, The Beijing Newsquoted the local government as saying.No injuries were also reported, according to the article. The acid was kept in an ageing tank and a drainage ditch nearby was filled with the bubbling chemical, video footage showed.An unnamed resident also claimed to the newspaper that some of the chemical had got into the sewage system.“Smoke was coming out of sewers and the smell was very pungent at about 9am,” the resident was quoted as saying.Remaining acid in the tank was transferred to another.Staff found the bottom of the ageing tank had given way, the report said.The tank could store 1,000 tonnes of sulphuric acid when full. 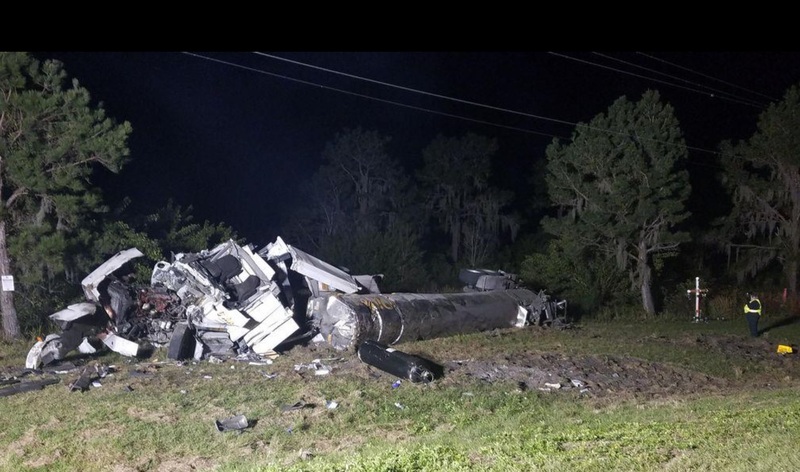 Florida A train carrying molten sulfur derailed in Polk County early Monday morning, deputies say. The Polk County Sheriff’s Office is at the scene of the derailment near Lakeland, near the intersection of Galloway Road and Kathleen Road.Deputies have issued a precautionary shelter in place order for people nearby, according to our news crew at the scene. People are being asked to close their windows and turn off the air conditioning. Polk County Fire Rescue is going door to door to let people on Strickland Road know about the shelter in place. Strickland is closed, and crews are not letting anyone go in or out. Parents are also being asked to keep a close eye on their children to make sure they stay inside.Crews found the derailment just before 2 a.m. while returning from a medical call in the area. Authorities say no one was hurt in the derailment.Investigators are now trying to figure out what caused the derailment. CSX is on the scene.Fire crews say Kathleen Road will likely be closed through some time early this evening. 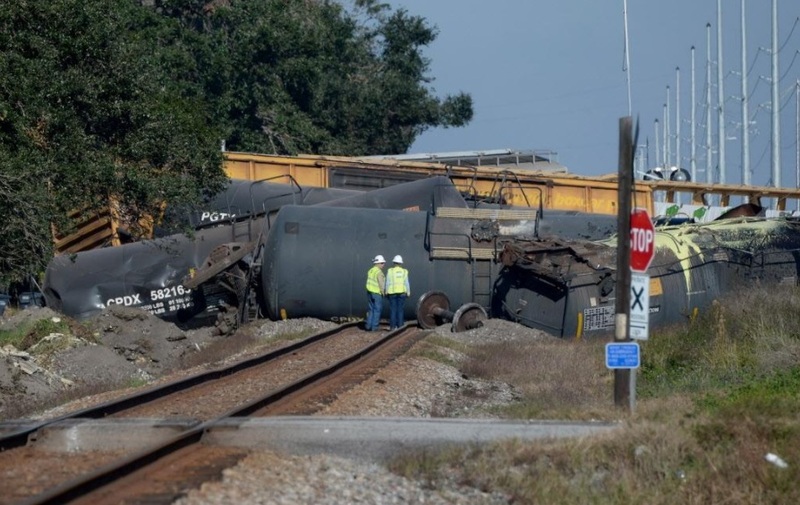 November 28, 2017 - CSX’s preliminary investigation found a faulty bearing on one of the cars caused a train to derail in Lakeland Monday, spilling thousands of gallons of molten sulfur.The Federal Railroad Administration is conducting the formal investigation into the cause. They tell us their findings won't be available until February.Meanwhile, crews cleared the tracks where the derailment happened. A different trained moved through the area much more slowly Tuesday morning. Spill November 25, 2017 India The Indian Oil Corporation Ltd (IOCL) on Friday clarified that there was no leakage of gas in its refinery. Rather spillage of molten sulphur in IOTL area led to minor burn injury of four workers. The incident had occurred on November 21 when maintenance was being carried out in IOTL area. The work has been outsourced to Indian Oil Tanking Utkal Energy Services Ltd which has its own infrastructure and manpower. The four injured were immediately taken to IOCL Hospital at Refinery Township before being shifted to SUM Hospital in Bhubaneswar. Their health condition is stable. Stating that the matter is being investigated by a senior level committee, an IOCL spokesperson said the management is committed to safety of its workers. Recently, the refinery was awarded Kalinga Safety Award at the Odisha State Safety Conclave for its practices. New Jersey A 26-year-old man suffered severe burns after he spilled sulfuric acid on himself late Monday evening at the James Alexander Corporation, according to police. At 9:40 p.m., state police and emergency medical services responded to 845 Route 94 on a report of a male who had spilled the clear, colorless liquid on himself, according to New Jersey State Police Sgt. Lawrence Peele. The East Stroudsburg, Pa., resident, whose name is being withheld by police due to protected medical information through HIPAA, suffered "severe burns" and was flown by helicopter to St. Barnabas Medical Center in Livingston, which houses a specialized burn treatment facility. It is unknown if the individual was employed at the facility, which is a dispensing company that offers filling services and single-use packaging for glass and plastic ampoules, snap-top vials and inhalants, among other items. According to the New Jersey Department of Health, sulfuric acid is used to make storage batteries, explosives and pharmaceuticals. When in contact with skin, the carcinogen is corrosive and can severely irritate and burn the skin and eyes. If the liquid gets into the eyes, it can cause blindness. Sulfuric acid, according to the department, instantly dehydrates skin and rapidly destroys human tissue, causing the skin to turn black from carbon residue. It is unknown if the individual was wearing protective equipment at the time. 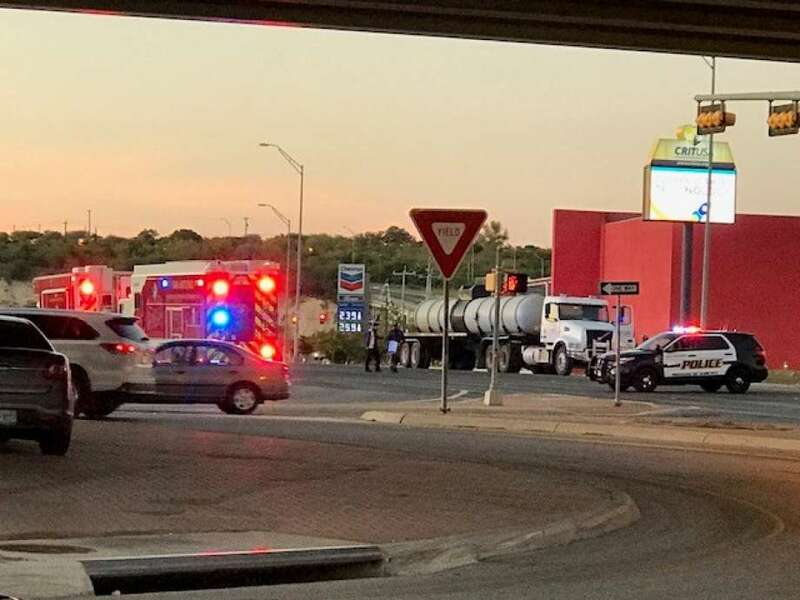 Texas The intersection of Thousand Oaks Drive and Wurzbach Parkway was closed Saturday evening as crews worked to clean hazardous material that spilled from a tanker, officials said.San Antonio Police Sgt. Gabe Trevino said authorities were called to the intersection around 6:10 p.m. to clean up an undetermined amount of sulphuric acid.Trevino said the driver of the transport rig was traveling south on Thousand Oaks Drive when he noticed material spilling from the top of his container tanks and pulled over to call authorities. Officers who arrived first at the scene inhaled some of the material, but did not require medical treatment, police said.Police said the leaking material was due to improperly sealed hatches on the top of the containers holding the acid. There were no injuries reported and authorities said they do not have a timetable for the reopening of the road.Traffic was beginning to back up along Interstate 35 and the parkway near the heavily traveled Thousand Oaks Drive. Kansas The Kansas Highway Patrol has closed Highway 50 west of Anderson Road in Finney County after two trucks collided Tuesday afternoon.One truck was carrying sulfuric acid. During the collision, a valve broke on the truck. The acid must be secured before the truck is moved, or the acid might spill.Officials closed Highway 50 west of Anderson Road, and it will take several hours to secure the leak. A crew from Wichita is responding to that scene to help.The highway patrol reports that no one was seriously injured in the collision. The Savannah Fire Department, Savannah Chatham Metro Police and emergency medical personnel responded to a sulfuric acid spill on West Bay Street Sunday afternoon. Savannah Fire Battalion Chief Elzie Kitchen said the department received a call about a Tidewater Transit Co., Inc. (TWT) truck leaking sulfuric acid on West Bay Street near Lissner Avenue. When fire crews arrived, SCMPD officers had already pulled the leaking commercial truck over. Kitchen said firefighters loosened the lid on the tank to reduce the pressure inside to mitigate the situation, but some of the acid had already spilled onto the ground. "We were able to contain that also," Kitchen said. "It was a little spill. It wasn't much. Even the area that we had pads on was probably a circumference of maybe 10 feet." Kitchen said he isn't sure how much acid leaked out of the truck, but said the truck's tank can hold 4,000 pounds of liquid. Sulfuric acid is colorless, oily liquid that's corrosive to metals and tissue, and "can result in adverse health effects from inhalation," according to the National Institutes of Health. Kitchen said everyone in the area, including about 30 people in a nearby church, was asked to shelter in place while crews cleaned the spill, and one police officer was overcome by the fumes. "If you come in contact with it, you can become overcome, lose your breath and [subsequently] pass out," Kitchen said. "So what we did was, for their safety, we had them shelter in place. By them being in that shelter, there should not be anything seeping in that building to hurt them. Had one officer that became overcome because he walked up to the vehicle. Had EMS to check him out. He's fine. I walked up to him. I talked to him after the EMS got through checking him out, and they said he was fine. He just, I guess he breathed in a little bit of the product, but he was fine, not enough to harm him." Kitchen said fire crews have the ability to evacuate people in a situation like this should they need to, and said they would move people early on in the clean up. Fire crews cleaned the spill in about 20 minutes, according to Kitchen, and wore protective hazmat gear to ensure they stayed safe. "You look like little chickens actually," he said. "Have the orange feet and the yellow bodies, but those are protective suits for us for chemicals. They keep the chemicals form splashing on our skin, and we also put respiratory protection on. And one thing that we always do before we go to any incident is make sure we've got a way of cleaning the product off them in an emergency situation, and when they come out." Kitchen said a third-party hazardous materials clean up company was called to remove the spilled acid from the ground. A truck from Kansanshi Mines has overturned at Kifubwa Bridge spilling sulphuric-acid into the Kifubwa River in Solwezi District. North-Western Water and Sewerage Company has since shut down six of its boreholes at Kifubwa well fields in order to assess the extent of the contamination. The incident happened around 07:00 hours this morning as the truck was on its way to deliver the chemical to the mine but tried to overtake a Toyota Spacio car. North Western water and sewerage company project Manager Mufalo Kabika has told ZNBC’s Patricia Banda at the accident scene that the shutdown will affect about sixty percent of its customers who get water from the boreholes. And Kansanshi mine safety manager Baston Sichinsamba says the mine has with immediate effect engaged the Zambia News and Information Service (ZANIS) to sensitise people not to eat fish from Kifubwa River. Mr. Sichinsamba says the other safety measure that will be put in place is to put lime around the accident scene and in the water to neutralise the chemical. Meanwhile, Ministry of Water Development Permanent Secretary Bishop Ed Chomba says the sulphuric spillage incident is unfortunate adding that a comprehensive statement will be issued soon. Bishop Chomba stated that polluting the environment is a serious offence under law. Rail cars carrying gas and sulfur on a CSX Corp freight train skidded off the tracks and burst into flames on Wednesday in a small Pennsylvania town, forcing hundreds of residents to flee their homes as firefighters fought the blaze. No injuries were reported after the crash in Hyndman, about 100 miles southeast of Pittsburgh. CSX warned customers service disruptions would last for a week over a nearly 80-mile stretch between Connellsville, Pennsylvania, and Cumberland, Maryland. CSX said 32 cars derailed as the train moved through the town just before 5 a.m. There was no word on what caused the crash. A freight car skidded into a garage that caught fire, and at least two train cars were still ablaze almost 12 hours later, said Bedford County emergency dispatcher Mike Steele. CSX said one rail car containing liquefied petroleum gas and one car containing molten sulfur leaked and were on fire. Authorities ordered the evacuation of residents in a one-mile radius, which encompasses most of the town, as emergency crews worried about the risk of an explosion, Steele said. Among the residents driving out of town was 53-year-old Shannon Shoemaker, who said his whole family lives within 100 yards of the derailment site. "They all got out safely, thank God for that," Shoemaker said. This was the third derailment for a CSX train since last November. It came two days after CSX Corp CEO Hunter Harrison apologized to customers for service disruptions and said some railroad employees were resisting planned cost-cutting measures. The train of five locomotives and 178 rail cars was traveling from Chicago to Selkirk, New York, CSX said. It said 128 cars carried mixed freight, including construction materials, paper and wood pulp. John Risch, spokesman for the transportation division of the SMART Union, which represents CSX conductors, said it is incredibly difficult for a small crew to handle a train with 178 cars. "It's hard to keep track of where the train is, especially as it snakes behind you for more than two miles," Risch said by phone. "I am not suggesting the length of the train caused the accident but it could have been a contributing factor." On Monday, Harrison, the CSX chief executive officer, told customers in a memo that some employees were resisting aggressive cost-cutting measures at the No. 3 U.S. railroad. Authorities closed roads and issued temporary restrictions on low-flying aircraft, Pennsylvania Governor Tom Wolf's office said, adding that Wolf was on scene in Hyndman. No public water supplies or waterways were affected, his office said. The governor's office said about 1,000 people had to leave their homes. An emergency shelter was assembled at a local school, staffed by aid workers from the American Red Cross and the Salvation Army, authorities said. CSX said company hazardous substance experts were working with firefighters at the scene to contain leaks and minimize environmental damage. Investigators with the National Transportation Safety Board and the Federal Railroad Administration were in Hyndman, the agencies said. In March, a CSX freight train containing sulfuric acid and other dangerous materials partially derailed near Newburgh, New York, though the dangerous substances did not leak. 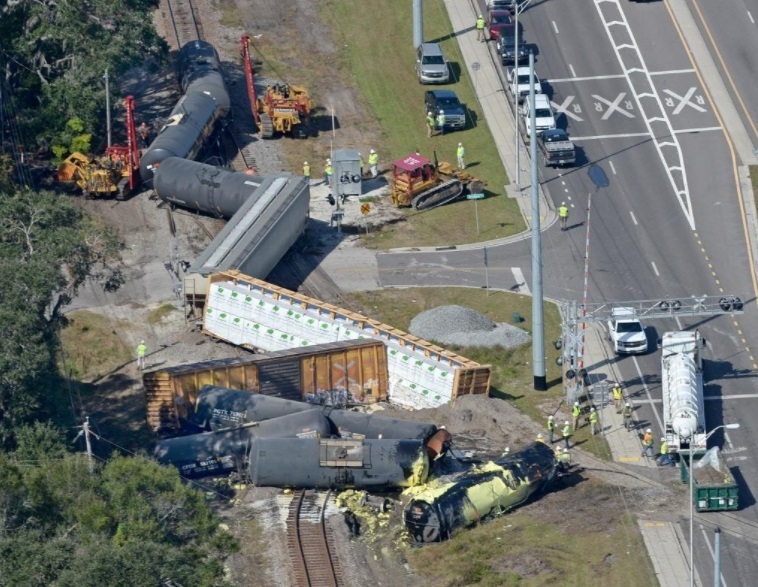 Last November, two CSX trains collided and derailed in central Florida, injuring two crew members. The probes into those incidents were still under way, said Federal Railroad Administration spokesman Warren Flatau. After the New York incident, the Times Herald-Record newspaper cited officials and witnesses as saying the train derailed after striking a forklift being driven across the tracks. ran Huge fire engulfed a sulfur warehouse at Esfahan refinery in central Iran this morning leaving at least 100 workers injured.The fire erupted at 11:00 local time and the gas produced from burning sulfur poisoned workers, ILNA news agency reported.According to the report, ambulances have been sent to the scene following the incident to transport victims to nearby hospitals.So far no report has been released on the death toll. 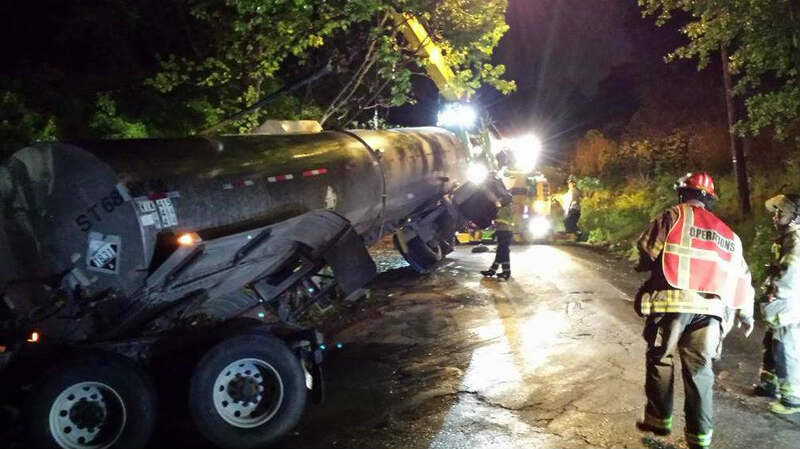 A tanker carrying 3,100 gallons of sulfuric acid overturned near the intersection of Rockland Road and Freehill Road in Hendersonville at 7 p.m. Tuesday night. According to Hendersonville Fire Chief Scotty Bush, around 500 gallons of sulfuric acid leaked onto the ground into a ditch. "Nothing got into the water system whatsoever," Bush said. "There were no injuries." The Hendersonville Fire Department worked alongside Nashville Fire Department's HAZMAT Response team for over 11 hours to clear the area. The tanker was on its way for delivery at the White House Utility District. According to Bush, firefighters off-loaded the 2,500 gallons of sulfuric acid that did not leak from the tanker before moving the vehicle. "Sulfuric acid is flammable and water-resistant. It is very, very toxic," Bush said. "It is very dangerous to anybody that comes in contact." Businesses along Rockland Road were evacuated Tuesday night to prevent any contact. Bush informed that the operation is completed but authorities are on the scene inspecting for any hazardous leftovers in the ditch. "They are still digging the whole ditch line out," Bush said. "They will get all the sulfuric acid back to the ground and fill the ditch again." Road April 18, 2017 Colville, WA First responders are enforcing a 1/4 mile perimeter around the scene of an overturned semi transporting a trailer of pressurized Sulfur Dioxide. The truck rolled off the narrow shoulder of Spanish Prairie Road half an hour ago and is upside down in a ditch one mile north of Colville. Sulfur Dioxide is an industrial chemical used in winemaking, among other things. The Center for Disease Control (CDC) classifies Sulfur Dioxide as "immediately dangerous to life and health." That said, the gas is not flammable and rarely fatal, due to the acrid smell and horrible sensation it causes in victims, which inspires those who breathe it to "run for their lives" according to the CDC. Spanish Prairie Road is closed in both directions just east of its intersection with US-395. This is a breaking news story and will be updated. The truck rolled over into a roadside ditch and is resting upside down. Spill March 20, 2017 Perth, Australia Traffic on the Kwinana Freeway southbound is chaos as emergency services work to clean up a hazardous chemical spill. The Department of Fire and Emergency Services reported sulphuric acid is believed to have leaked from a vehicle travelling along the freeway. The spill is believed to have occurred between Mill Point Road and South Terrace this afternoon. Kwinana Freeway exit to South Terrace southbound has been closed. Anyone who has driven through the area should hose down their vehicle - preferably on grass. Motorcyclists should also hose down their clothing immediately before a thorough wash. The incident was reported at 4pm. Rail March 15, 2017 Lake Forest Lake Forest-area residents might have dodged a bullet Wednesday after a freight train carrying sulfur derailed but did not spill.The Federal Railroad Administration is investigating the situation that started shortly after 3 a.m. when 11 rail cars went off the rails and piled up alongside the Union Pacific Railroad tracks. Nine of the rail cars contained molten sulfur, a hazardous substance in liquid form that is used to make sulfuric acid. No leaks or injuries occurred, authorities said. "I think it's fortunate there were no injuries, it wasn't around a densely populated area of town, and there was no further damage relative to spills and leaking," Lake Forest Mayor Donald P. Schoenheider said.U.S. Rep. Brad Schneider of Deerfield noted that "an accident like this is a clear reminder that we need to be constantly working to enhance the safety of our rail lines and protection of our communities. "UP crews were still righting rail cars using cranes on a section of track just east of busy Route 41 and west of Deerpath Road Wednesday afternoon.Air quality is still being monitored. Sulfur typically has a rotten egg smell and can irritate or burn the skin upon exposure.The derailment occurred on tracks that are not used by Metra.Authorities could not say at what speed the train was traveling or give a preliminary cause of the derailment. The federal investigation could take a few months. "We are all grateful that no one was hurt and no hazardous materials were released in the derailment," said Schneider, a Democrat whose district includes Lake Forest.The derailment occurred near the Skokie River Nature Preserve, which contains trails, virgin prairie and rare species.Terri Janecki, who was out walking her dog, called it "scary. I wonder what made it derail?" she said.Pam Gilmore, who was skiing in the preserve, wondered why there was no notification for visitors at the entrance and was relieved nothing spilled into the environment. "There's a wonderful spring-fed river" in the preserve, she said.Concerns about rail and hazardous materials have risen in the suburbs with a spike in trains carrying crude oil and ethanol and a number of high-profile derailments. "We're digging deep into the impact of freights. There's an increase in freight traffic, trains are getting longer and more frequent, locomotives are getting heavier," Schoenheider said. "We're really trying to explore what's going on, who controls this and what we can do to lessen the impact to residents. "Lake Forest firefighters and police officers first on the scene were able to interview the engineer, review the manifest and quickly determine nothing was leaking, Police Cmdr. Craig Lepkowski said.Firefighters then called out the Lake County and McHenry County Hazardous Materials Teams to "ensure all was OK and to be on hand if there were any issues," Lepkowski said.Authorities warned of intermittent lane closures throughout the day on northbound Route 41. "We apologize for the impact to commuters on nearby Highway 41," UP spokeswoman Calli Hite said.The train was traveling from Butler, Wisconsin, to Chicago. Two of the derailed cars were empty.The National Transportation Safety Board is investigating a recent fiery derailment of 27 railcars on a UP train carrying ethanol in Iowa March 10. A CSX freight train carrying hazardous materials has derailed in New York's Hudson Valley, spilling sulfuric acid. The lead locomotive of the 77-car train ended up straddling both lanes of a two-lane road in Newburgh, 60 miles north of New York City. State police say two crew members suffered minor injuries. They say the train derailed after striking an equipment loader that was crossing the tracks Tuesday afternoon. CSX spokesman Rob Doolittle says the train was carrying sulfuric acid, sodium hydroxide, cardboard, corn oil and glass products. Spill March 3, 2017 Bridgman, Michigan More than 1,000 gallons of sulfuric acid has leaked into a containment area outside a nuclear plant in southwestern Michigan. The Nuclear Regulatory Commission reports on its website that cleanup is ongoing Thursday at the Cook Nuclear Plant in Bridgman, southwest of Grand Rapids. The agency says none of the acid was released into the environment or nearby drains. The leak was discovered Wednesday. More than 1,000 gallons of sulfuric acid has leaked into a containment area outside a nuclear plant in southwestern Michigan. The Nuclear Regulatory Commission reports on its website that cleanup is ongoing Thursday at the Cook Nuclear Plant in Bridgman, southwest of Grand Rapids. The agency says none of the acid was released into the environment or nearby drains. The leak was discovered Wednesday. Spill February 16, 2017 Oberhausen, Germany About 150 people suffered breathing problems Thursday after sulfuric acid spilled from a burst tank belonging to a chemical company in the western German city of Oberhausen and turned into a toxic cloud. About 130 firefighters and emergency staff treated most people on the scene. Five people had to be taken to the hospital. The spill was caused when a ship accidentally pumped hydrochloric acid into a tank containing sulfuric acid causing the tank to burst, the German news agency dpa reported.Firefighters' spokesman Joerg Preussner said that most people had only light breathing troubles, but that everyone in the area had been asked to stay inside and close the windows. Train and bus lines were stopped for hours, and city streets, a canal and a highway were temporarily shut down to keep people away from the area. All schools and kindergartens were ordered to keep children inside the buildings until the early afternoon. The visible cloud, which slowly moved to the northeast of the city, was several hundred meters (yards) wide. Preussner said that firefighters had used water cannons and successfully fought the cloud with water mist. The burst tank was pumped empty and the toxic mixture was taken away by tanker trucks. A chemical train has derailed in southern Illinois, releasing a small amount of sulfuric acid. 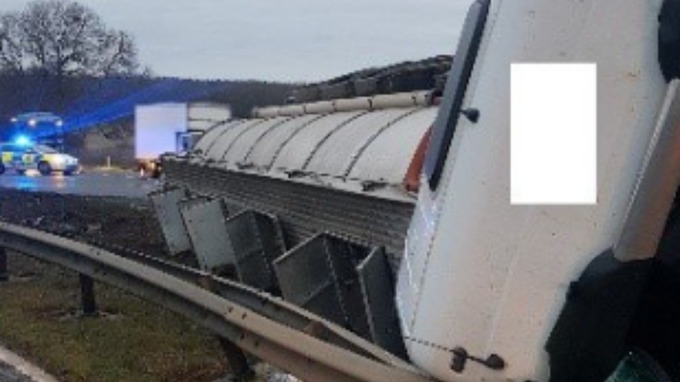 Seven of the Norfolk Southern train cars came off the track Thursday morning, Dec. 29, in Roxana, the Alton Telegraph reports. Two of the cars overturned. Norfolk Southern spokesman David Pidgeon said about a gallon of waste sulfuric acid leaked, but was later contained. No injuries were reported. Sulfuric acid is used by energy companies in the petroleum refining process. The tracks are owned by the railroad and serve the Wood River Refinery. The newspaper reports that about two dozen firefighters from the refinery responded to the derailment and spill. Roxana is southwest of Springfield. Fire December 28, 2016 Atmore, Alabama Firefighters battled a sulfur fire at Tiger Sul for some five hours this morning, according to officials.Atmore Fire Chief Ronald Peebles said the fire possibly started in the conveyor belt, and didn’t spread into the hoppers. “The fire burned the ceiling,” he said. Peebles said Poarch, Nokomis and Walnut Hill fire departments were also called for manpower. “We got the call around 4:30 a.m. and finished around 10 a.m.,” he said. “It was contained in one part of the building, and it burned the insulation off the building.” Peebles said what makes sulfur fires unique is its physical state — a fine dust. “It’s kind of like putting water on grease,” he said. “You hit it with water and the dust is so fine, it ignites like gasoline.” Peebles said firefighters used a fog stream, or mist, to quell the flames. “We put a lot of water on it,” Peebles said. Additionally, Atmore Ambulance was present and provided a rehab center for firefighters going in and out of the fire. 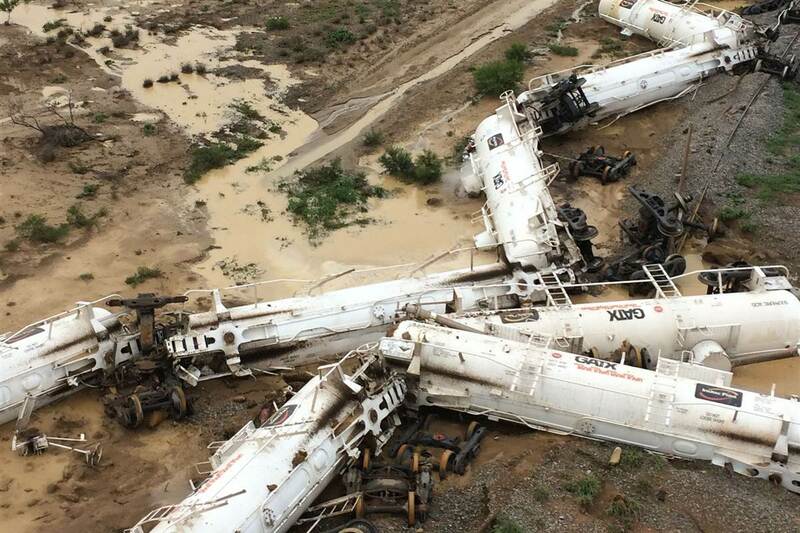 A damning report into a derailment at Julia Creek which caused thousands of litres of sulphuric acid to leak from damaged tankers has found failings by Queensland Rail and Aurizon. The report released by The Australian Transport Safety Bureau into the derailment on December 27 last year, found the accident was caused by wet weather damage to the track. ATSB concluded that QR and Aurizon had inadequate reporting procedures to identify and respond to potentially dangerous situations caused by wet weather. No fault was found with the acid tankers or the manner of driving. The report said the locomotive driver spotted the wet weather damage but couldn’t stop in time. “The driver became aware of the washout only moments before the locomotive impacted and derailed, causing the locomotive to tip on its side,” the report stated. It was also found that the Aurizon train crew had trouble getting out of the locomotive as floodwater started filling the cabin. The crew tried unsuccessfully to use the emergency hammer to break through the front windscreen before eventually escaping by climbing out a side window. One of the crew members then noticed an acid plume rising from the derailed tankers and as they had no breathing masks, decided to flee the accident scene. As the crew’s radios had fallen into the floodwater, they also had no way of calling for help. They managed to flag down a passing motorist who let them borrow a mobile phone. 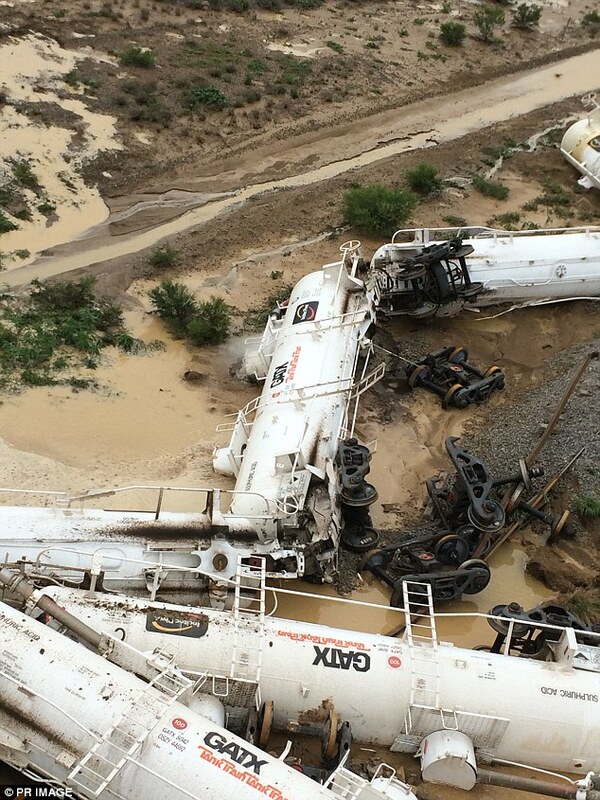 As a result of the derailment QR now issues safety alerts to better manage wet weather hazards while staff have also received training in interpreting weather ­information. Aurizon crews transporting acid are now supplied with respiratory protection masks and they are reviewing their emergency evacuation procedures. They are also reviewing their locomotive windscreen and communication options. The ATSB report stated in the safety message that this incident showed the importance of managing risks to rail infrastructure. “Rail infrastructure managers must implement adequate operational procedures and training programs to ensure the timely identification and management of a hazard and the integrity of their rail infrastructure, such as a weather event,” the report stated. The Aurizon freight train was transporting more than 800,000 litres of sulphuric acid when it went off the tracks about 20km east of Julie Creek. Thousands of litres of acid was spilt and the three crew on board received minor injuries. American Proteins poultry rendering facility in Hanceville will have to pay a $50,000 fine for spilling 900 gallons of sulfuric acid into the Mulberry Fork in August. The Alabama Department of Environmental Management investigated the mishap which killed an estimated 38,000 fish across a 1.55-mile stretch, according to its consent order with the company, released this month. Residents were advised to avoid the river until the watershed could be cleaned up following the Aug. 17 spill. Since then, American Proteins has eliminated the use of sulfuric acid entirely at its facility, according to the ADEM order. The company is also taking steps to ensure that this type of spill does not occur in the future,” General Manager Jason Spann said. ADEM’s investigation revealed a pipe from a sulfuric acid tank ruptured and filled a containment berm. A clean-out valve on the self-containment tank had been left in the open position by a vendor who had filled up the tank earlier in the day, according to the order. The acid drained from the containment berm, into a storm drain and into a storm water collection pit. There it mixed with stormwater and flowed into the Mulberry. American Proteins immediately reported the spill to ADEM and began pumping storm water from the pit and covering storm drains behind the facility to prevent inflow of any storm water. It also hired a third-party contractor to make repairs to prevent leaks, collected water samples and pH readings and altered its permitted discharge to reduce the effects of the accidental discharge, according to the order. The concrete where the leak occurred was also replaced. American Proteins is the largest poultry rendering plant in the world. The facility in Hanceville is located on more 600 acres and employs around 230 employees. It averages processing 35 to 36 million pounds of “offal” per week. Offal is parts of the chicken consumers don’t eat. The raw material is turned into nutrient-rich feed supplements for poultry, livestock and pet food industries around the globe. The Hanceville plant began operating in the 1960s, but was acquired by American Proteins in December of 1979. Environmental - Release November 25, 2016 Thailand More than 30 residents of Prachinburi’s Si Maha Phot district were hospitalized Thursday night by a factory chemical spill. A factory belonging to Sunshine Biotech International released large clouds of sulfuric acid into the air which spread to the neighboring households, sickening those inside. Many suffered from skin rashes, had difficulty breathing and vomited blood. They were sent to Chao Phya Abhaibhubejhr Hospital, according to police Col. Narat Rattanajinda. About 100 angry residents protested at the factory located in the 304 Industrial Park on Thursday night, demanding its closure. They said it was not the first time the corrosive gas leaked. Whether the factory is closed or faces any legal sanction depends on the outcome of a meeting Friday morning in which the provincial governor participated. According to its website, Sunshine Biotech is a joint venture between Thailand and China that manufactures citric acid. The Tesoro Corp. has yet to determine the cause of the Aug. 26 sulfur tank breach at its Los Angeles Refinery. The tank was being used to store molten sulfur. After the lid of the tank was breached, a plume of gases escaped from it. The tank’s insulation caught on fire. Along with Tesoro, the Los Angeles County Fire Department and the Los Angeles County Sheriff’s Department responded to the incident. The fire was extinguished before the tank was significantly damaged. No injuries due to the tank breach were reported. The sheriff’s department ordered businesses and residents within a quarter mile to “shelter in place,” while responders surveyed the damage due to the breach. This means buildings were to be sealed by closing doors and shutting windows, so that harmful gases could not easily enter. Jesse Marquez, executive director of Coalition for a Safe Environment said that this technique is only effective if buildings are sealed immediately after an incident. If a building were to be sealed after gases already diffused inside, occupants could actually be harmed more than if the building were not sealed at all. The South Coast Air Quality Monitoring District conducted air monitoring and sampling of the surrounding area. The district concluded that harmful levels of toxic chemicals were not present. The refinery continued to operate while the tank was being inspected. Marquez said that knowing the type of breach will help investigators focus on its cause. The two main types of tank breaches are cracks or ruptures. Both can be brought on by external and internal factors. However, cracks are more likely due to metal fatigue of the tank over time. Ruptures can be caused by something more immediate, such as a bolt hitting the tank. Tesoro is coordinating with the California Division of Occupational Safety and Health to determine the cause of the tank breach, as well as the exact type of breach. A tractor-trailer hauling sulfuric acid drove off the roadway in Halsey on Thursday and ended up on its side in a field, spilling a small amount of the toxic substance, according to the Linn County Sheriff’s Office. Sulfuric acid is a strong corrosive chemical that can cause burns. It is used in car batteries, fertilizers and some cleaning materials, among other products. The truck was on American Drive near Powerline Road when the single-vehicle crash occurred for an unknown reason. The driver of the truck, Dawn Loftis, 69, of Woodland, Wash., suffered minor injuries in the crash, authorities said. A small amount of the acid leaked but did not pose a risk to the public, the sheriff’s office said. A hazardous materials team responded, and another truck was called in to off-load the tanker’s acid haul, according to authorities. The road was open and was not blocked, authorities said. Explosion August 27, 2016 Wilmington, CA A sulphur tank has exploded at the largest oil refinery in California, sending a chemical cloud into the air and causing a fire, US authorities say. No injuries were reported. There was no immediate word on the cause of the blast at the Tesoro refinery in Wilmington near Long Beach. ``We are currently conducting air quality monitoring around the site,'' company spokesman Destin Singleton said. ``At this time we have not detected any harmful levels of toxins.'' The Los Angeles County Fire Department sent in a hazardous materials team and the Sheriff's Department urged people within 400 metres of the scene to stay indoors. The refinery near the Port of Long Beach is the largest refinery on the west coast, according to Tesoro. It produces petrol, jet fuel, diesel and other fuels. Spill August 26, 2016 Oklahoma The crash of a tractor-trailer truck in southern Oklahoma has resulted in the death of its driver and the release of hazardous sulfuric acid. The Oklahoma Highway Patrol says 49-year-old Randy Lewis Perkins of Sapulpa died in Wednesday's crash along U.S. Highway 69 at Caddo in Bryan County. Troopers say the crash occurred shortly before 4 p.m. when a 2016 Peterbilt truck veered off the roadway and struck a bridge. Perkins was ejected about 15 feet and was pronounced dead at the scene. The patrol says the collision released the truck's hazardous sulfuric acid cargo, exposing and damaging other vehicles. Troopers say the extent of damage was being assessed. It was not immediately known if the victim was wearing a seat belt. The cause of the crash is under investigation. A tanker carrying chemicals has run aground in waters off the Mornington Peninsula, south-east of Melbourne. The ship, the Hope Singapore, is believed to have hit a sandbar off the coast of Rosebud after its engine failed. Port of Melbourne Corporation chief executive Nick Easy said authorities believed the ship would float clear of the sandbar at high tide. Mr Easy said the ship did not pose an environmental risk. "It has sulphuric acid on board but there's no pollution or damage that's led to any environmental incidents and there's no navigational safety risks as a result of this at this stage," he said. The 115-metre-long small liquid bulk carrier was en route to Geelong when it ran aground early on Friday evening. Mr Easy said early attempts to move the vessel out of the sand using a tug boat were unsuccessful. No details of how many crew members were on board were available. The Harbour Master, Water Police and other agencies were expected to investigate the incident. Spill August 19, 2016 Hanceville, Alabama The Alabama Department of Environmental Management says it is investigating a release of about 900 gallons of sulfuric acid that occurred at the American Proteins Facility in Hanceville.ADEM spokesman Jerome Hand said Thursday that the sulfuric acid reached the Mulberry Fork, resulting in fish being killed. ADEM is investigating the cause of the release and monitoring the situation.Hand says the Alabama Department of Conservation and Natural Resources has been contacted to assess the extent of the fish killed. ADEM advises that all recreational activities in the Mulberry Fork stop until more information is available. Environmental - Release August 14, 2016 Geismar, LA Residents near the Honeywell Plant were alerted just before 11:30 pm that the sulfuric acid leaks at the plant were "under control," according to a fax from Iberville Parish emergency authorities.Residents had been asked to shelter in place after the leak was discovered. A second leak occurred not long after the first, authorities said.Chief Kevin Ambeau of St. Gabriel Police said he could see a cloud of gas after the release from Honeywell. He advised everyone to shelter in place in the St. Gabriel and Carville areas.First responders reported burning eyes due to the gas.A statement from Honeywell spokesperson Peter Dalpe read as follows:“Honeywell's Geismar facility experienced a leak of sulfuric acid this evening. The facility's emergency response team is working to mitigate and stop the leak. The plant has instructed employees of the site and two neighboring sites to shelter in place as a precaution. The facility also notified state police of the incident as per plant procedure.”The plant is located at 5525 Highway 3115 in Geismar. 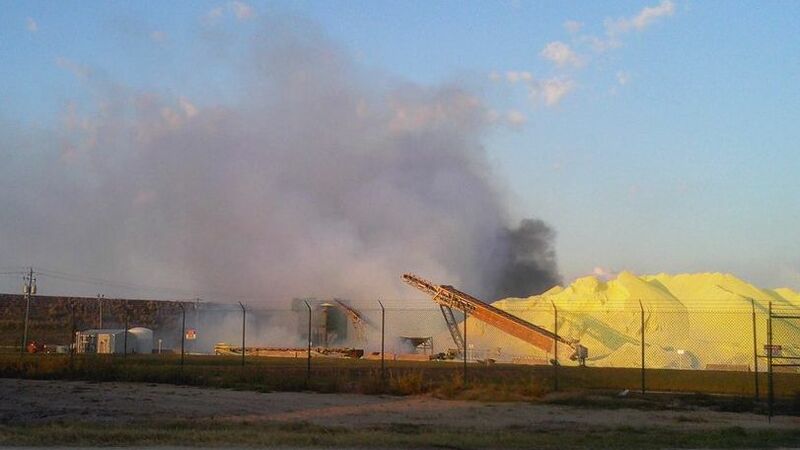 Fire crews have been sent to a site in Perth's industrial south where a pile of sulfur is smouldering. The Department of Environment and Regulation (DER) have also headed to Bis Industries on Port Road in Kwinana to test for environmental hazards. Fire authorities said they were alerted just after 7:00pm and three HAZMAT alarms had gone off. There was up to 70,000 tonnes of sulfur stored in a shed and at least part of it was "smouldering", a Department of Fire and Emergency Services spokesman said. More than 20 fire fighters were last night on the scene. The sulfuric acid spill that closed down Interstate 81 Monday evening was successfully contained and was kept from harming the environment, according to the Pennsylvania Department of Environmental Protection (DEP). “None of the material spilled made it into waterways or into the environment beyond the roadway,” John Repetz, spokesperson for the DEP, said. The DEP’s emergency response unit went out to the incident to provide air monitoring and are sent out to spills on an as-needed basis depending on the nature of the incident, according to Repetz. The spill, which occurred near mile marker 86.5, was the result of two leaking 275-gallon totes – cube-shaped, plastic containers meant for the bulk transport of fluids – that were being hauled inside of a tractor-trailer. There were a total of 12 such totes on the trailer, and when the driver noticed fluid leaking onto the roadway from the trailer, he immediately pulled over and called 9-1-1, according to Repetz. Because of an existing traffic backlog on Interstate 81 due to a crash in Dauphin County, the driver found that he had to come to a quick stop as he entered the curve where Interstates 78 and 81 merge, according to information provided by David Beohm, public information officer with the Pennsylvania State Police. The truck entered the curve, encountered the backlog and "slammed" his brakes on to avoid colliding with the stopped vehicles," Beohm said via email. "When he did, several of the totes of sulfuric acid broke from the skids they were secured to, fell over and spilled the contents." 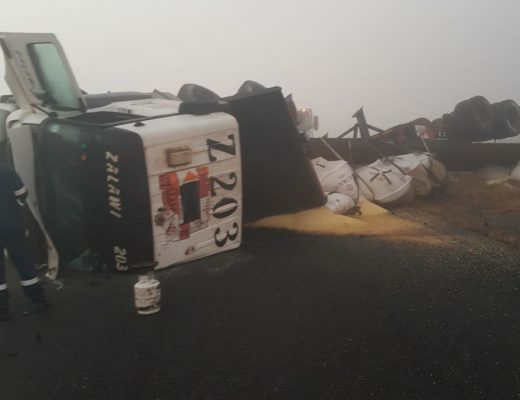 The driver was initially unaware of the leaking totes and drove slowly in the backed up traffic until he looked back and saw something leaking from his trailer, according to the information Beohm provided. “From the beginning, when the driver realized there was a problem, he took appropriate action,” Repetz said. “The trucking company had all the proper paperwork and was able to advise us on exactly what was in the totes.” After the driver made the call at 5:22 p.m., the Lebanon County Hazardous Material Response Team leapt into action along with state police from Lickdale, fire crews from Ono, Jonestown, Fort Indiantown Gap, Green Point and Fredericksburg, fire police and the First Aid and Safety Patrol. “Upon their arrival, crews took caution and closed down Interstate 81 in the area of the event due to the unknown size of the leak, and the weather conditions that were present at the time,” Gary Verna, chief of the Lebanon County Hazardous Material Response Team, said. Verna, a former lieutenant with the First Aid and Safety Patrol, took over as chief of the HazMat team early in July. The weather conditions Verna mentioned involved a strong thunderstorm that was moving through the area at the time. “Of course, we had a severe thunderstorm that crossed our path during our response which made things a little tricky,” Verna said. “The storm delayed us a little bit in getting the leak stopped, but we were able to get the spill contained before the storm hit.” When the storm hit, Verna called the crews away from the spill to let the storm – and its dangerous lightning – pass before going back to work. “We had Lancaster County’s hazardous materials team dispatched after we found out that it was an active leak,” Verna said. “We closed down Interstate 81 in both directions because the acid started to fume, and those fumes were going across the roadway. We wanted to prevent any passing motorists from getting harmed by the fumes.” Interstate 81 was closed both directions from the Grantville exit to the Lebanon exit for several hours. “By 10 p.m., the northbound lanes were open, and by 10:30 p.m., the left southbound lane was open,” Verna said. “Shortly after midnight, the southbound lane was totally open.” The initial sealing of the leak and containment of the spill did not take very long, according to Verna. It was the cleanup that followed that took the most time. “Environmental Products & Services, based out of Vermont, was the company that was contracted to perform the cleanup,” Verna said. “Transportation companies typically have people they contract out for cleanup.” Contracting the cleanup of a spill to an outside company is common practice, according to Repetz. “There are companies that specialize in doing the cleanup after incidents like this,” Repetz said. “They have trained and qualified personnel that will come out and do the cleanup after a spill has been contained.” The response to the spill by emergency services was very successful, according to Verna, and Repetz agreed. “Anytime you prevent a hazardous materials spill from reaching a waterway or wildlife, you could say it was successfully dealt with,” Repetz said. 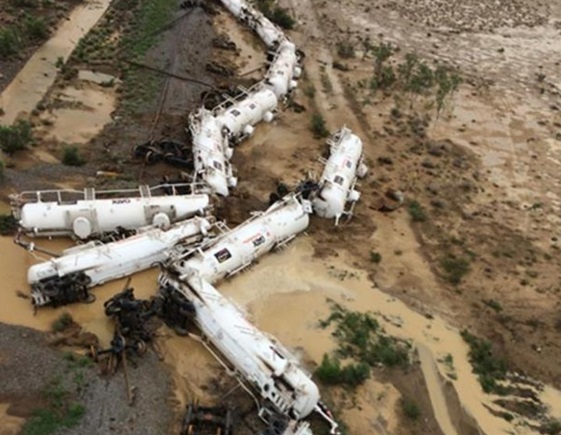 Australia A freight train carrying about 40 wagons of sulphuric acid derailed near Julia Creek early Saturday morning. 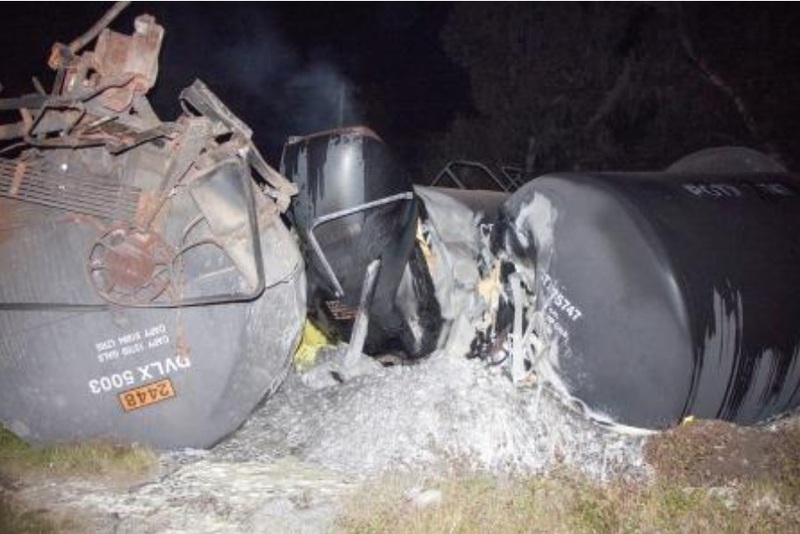 A Queensland Rail spokesperson said about 4am an Aurizon train derailed 15km east of town – barely 15km from where a train derailment caused a major spill of sulphuric acid in December. The cause of that accident was flooding but the cause of the latest accident is not yet known though no one was injured. 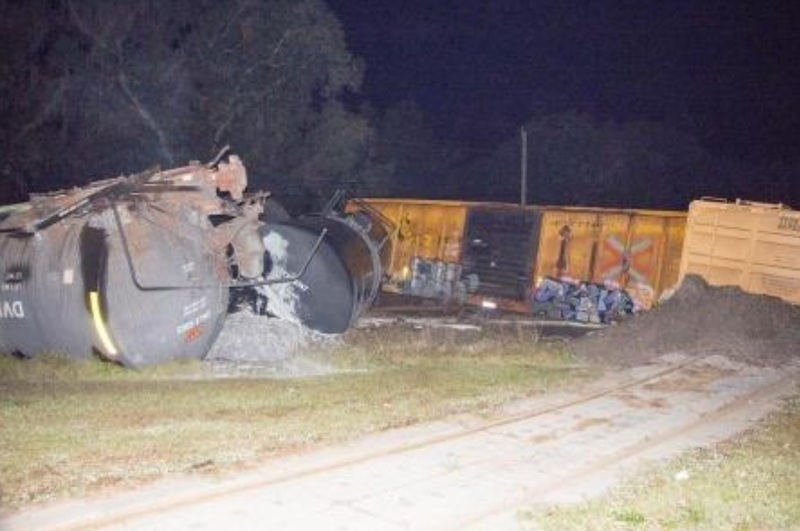 Four of the wagons left the tracks but remained upright and Queensland Rail said there were no leaks. The Queensland Fire and Emergency Service said they received a call about 4.35am, two crews attended the scene and after assessing the carriages found no apparent leaks. The train was heading west from Townsville to a mine site when it came off the tracks. Two passenger trains travelling between Mount Isa and Townsville have been cancelled. Queensland Rail safety investigators are on their way to the scene. Spill July 1, 2016 Watertown, NY Workers at Knowlton Technologies Inc., 213 Factory St., were evacuated Thursday morning after a toxic chemical reaction occurred on one of its product lines. City Fire Chief Dale C. Herman said that at about 6 a.m. a worker was infusing a product line with chlorine when a nearby sulfuric acid line broke, causing the chemical reaction. The chief said the worker “had the presence of mind” to stop the flow of sulfuric acid and immediately diluted the reaction with water. Fumes filled the building’s lower level, prompting evacuation of all employees. Chief Herman said fire crews arrived and placed absorbent materials on the mixed chemicals and began ventilating the building. An odor of chlorine also was noted in the office areas of Knowlton and those areas were ventilated. “Everything was contained to the building,” Chief Herman said. “There was no escape to the public.” Workers in the immediate area of the reaction were evaluated by Guilfoyle Ambulance Service personnel, but none exhibited acute symptoms, the chief said. He said the workers will continue to be monitored in the coming days and, if they experience any difficulty breathing or other ailments, have been advised to seek medical treatment. By 8 a.m., workers had been allowed back into Knowlton’s building on Beebee Island along Mill Street. Chief Herman said the remainder of the workers were expected to be allowed to return to the Factory Street buildings by about 9 a.m. Fire crews cleared the scene just before 11 a.m.
Spill June 28, 2016 Ulsan, South Korea About a thousand liters of sulfuric acid leaked from the construction site of a smelter factory in the country's industrial city of Ulsan Tuesday, injuring six workers, firefighters said. The incident took place at around 9:15 a.m. at a factory owned by Korea Zinc Inc., the country's largest zinc smelter, some 414 kilometers southeast of Seoul. The chemical at some 70 percent concentration leaked as six workers were disassembling pipes for maintenance. All six are suffering from burns, with three of them in critical condition, authorities said. Firefighters said they are investigating whether there is any secondary damage from the accident. Earlier in the day, about a ton of waste chemicals comprised of hydrochloric acid, nitric acid, hydrofluoric acid and water spilled out of a tank due to chemical reactions in Gumi, 261 kilometers southeast of Seoul. The firefighters completed cleanup of the spilled chemicals at around 5:30 a.m., about three hours after the incident was first reported. They said no harmful chemical substances were detected near the site of the accident. Loveland and Fort Collins fire crews responded to a sulfur dioxide leak Thursday morning at Cardinal CG, 999 N. Van Buren Ave. The coated glass plant reported a 200-pound cylinder was leaking the potentially toxic gas at 8:36 a.m., according to Loveland fire Battalion Chief Jason Starck. Two employees were exposed to the sulfur dioxide. They were treated by Thompson Valley EMS crews and released at the scene. "Mainly (sulfur dioxide) is an irritant," Starck said. "But it can be toxic in high-enough doses. It can cause burning of the skin." Carie Dann, Loveland deputy fire marshal, said the gas can also cause respiratory issues. Loveland Fire Rescue Authority evacuated the rest of the building as a safety percaution, as crews were on scene were entering the building in hazmat suits to isolate and fix the leak, Starck said. The sulfur dioxide is used in the company's process in treating glass. Poudre Fire Authority crews responded as well — they brought extra personnel and additional monitoring equipment. "Hazmat takes a long time," Dann said. "It's very labor intensive, that's why PFA is here. ... It's to help make sure the entry team is dressed properly — so, it takes a lot of folks to do that. Once we know it's a hazmat scene, everything slows down and we become very deliberate." According to reports on the scanner, the leak was contained at 12:56 p.m.North Van Buren Avenue was closed from West Eighth Street to West 10th Street while crews worked. Transportation - Road June 5, 2016 Umvoti Ultra CitySouth Africa 14 people are receiving treatment for severe respiratory issues after a truck carrying sulphuric acid overturned on the N2 between KwaDukuza and Ballito on the north coast. The truck crashed on the southbound carriageway at the Umvoti Ultra City yesterday afternoon. Emergency services had to close the road for some time as crews attended to the scene. IPSS Medical Rescue’s Paul Herbst says patients were immediately rushed to hospital. "They were transported by IPSS emergency services and by private transport through to hospital for further care. The road was closed for quite a substantial amount of time," he said. "The sound bound lane has been reopened, but the Ultra City still remains closed," Herbst said. A truck carrying sulphuric acid overturned at the Umvoti Ultra City, south bound, on Saturday, IPSS Medical Rescue said. The truck carrying sixteen 1 000-litre containers overturned in the parking lot of the Ultra City, IPSS Medical Rescue spokesperson Dylan Meyrick said. "At the moment, we are not sure how many containers have ruptured because there is too much gas," he said. Fourteen people were taken to hospital. Meyrick said the fire department and medical rescue teams were on the scene trying to contain the situation. A leak of sulfur dioxide gas from a tanker truck on Thursday afternoon prompted the response of hazardous materials crews to an vacant lot near I-30 in Little Rock, a fire department spokesman said. The driver of the truck first smelled the leak while getting gas from the Love's Travel Stop near the Outlets of Little Rock and drove the tanker to the lot about 1 mile away, Capt. Jacob Lear-Sabowsky of the Little Rock Fire Department said. Lear-Sabowsky said the leak was reported about noon, and the scene was cleared by 3:30 p.m. No injuries were reported. The leak was in gas form, and no liquid had spilled on the highway, he said. Check back with Arkansas Online for updates on this developing story. Fire May 23, 2016 Riverview, Florida A tank of molten sulphur caught fire Monday afternoon near the Mosaic Co. plant in Riverview. The fire briefly shut down traffic on U.S. 41 between Madison Avenue and Gibsonton Drive. One firefighter hurt her wrist tightening a tank valve, Hillsborough County Fire Rescue said. No other injuries were reported. The fire broke out about 3:30 p.m. inside the plant at 8814 S. U.S. Highway 41, and workers used steam to extinguish it. The fire was contained inside the tank, officials said. "It's no danger to the public," Mosaic spokesman Richard Gent said. An overturned 18-wheeler has shut down a Geismar road as hazardous materials crews respond to the scene.Jefferson Highway, also known as La. 73, is blocked between La. 30 and River Road, after a big rig incident about 11 a.m., said Louisiana State Police spokesman Trooper Bryan Lee. The 18-wheeler tanker contained sulfuric acid and a small amount of it is leaking from a safety valve on the tanker, a parish homeland security official said. Rick Webre, director of Ascension Parish homeland security, said that the valve is actually performing as it should be and the acid poses no threat to traffic or the surrounding area. He said no evacuation has been ordered for the area or the traffic site. He said a contractor is being called in to remove the sulfuric acid from the tanker. A key thoroughfare was reopened late Thursday night after about 300 gallons of sulfuric acid spilled on State Road A1A earlier in the day and officials have begun calculating the cost of the cleanup. At 9:38 a.m., a skid holding a large container slipped off a flatbed truck as it traveled on S.R. A1A just north of the State Road 100 intersection, spilling the 50 percent sulfuric acid solution. A hazmat team from St. Johns County was called in to neutralize the solution and the state departments of Environmental Protection and Transportation were notified. Within three hours, the spill was neutralized with sodium bicarbonate, officials said. Units from the Flagler Beach Fire Department, Flagler County Emergency Management, Flagler County Fire Rescue, Flagler Beach Police Department, Flagler Beach Fire Police and Palm Coast Fire Police also responded. No injuries were reported. 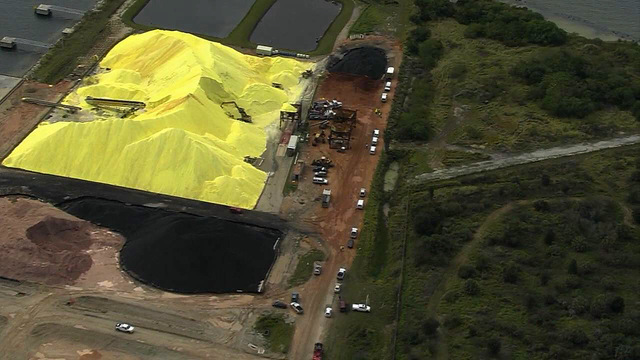 SWS Environmental Services, a contractor for Dumont Chemical Co. of Apopka, which owns the truck, excavated neutralized sand along the roadway, according to a report from the county. Flagler Beach Fire Department Capt. Bobby Pace said between 8 and 12 inches of the sand was excavated and about 36 yards of fill was brought in. In his conversation with the DEP, he didn't get any indication that there has been any long-term damage. Florida DOT contractor TME Enterprises reopened the road at 11:15 p.m. Thursday after declaring it “fully operational,” according to Steve Garten, the county's emergency services director. The city's Public Works Department still had the shoulder barricaded Friday morning. “Hopefully, it will be business as usual by the weekend,” said Pace. Flagler Beach Police Capt. Matthew Doughney said Thursday the truck driver had a valid license and was approved for transporting hazardous materials. Though the investigation was continuing, Doughney did not anticipate the driver would be charged in the incident. Flagler Beach City Manager Larry Newsom said the city is compiling an invoice to be sent to the shipper, Hawkins Inc. of Apopka. He indicated that the various agencies involved may be compiling their own invoices. He did not have a cost estimate for the cleanup as of Friday. Hawkins formulates, manufactures, blends, distributes and sells chemicals to municipalities and businesses. Water treatment facilities are among the company's customers. According to the company's manifest, the acid solution was bound for the Dunes Community Development District at 101 Jungle Hut Road, Palm Coast. The district is responsible for a host of water and wastewater issues at four private communities north of Flagler Beach: Hammock Dunes, Ocean Hammock, Hammock Beach and Yacht Harbor Village. About 800 gallons of sulfuric acid leaked from a tanker Tuesday morning inside the TB Simon Power Plant on Michigan State University's campus, causing the majority of workers to be evacuated, officials said. The chemical spill happened around 8:30 a.m., and Service Road between Harrison Road and Farm Lane was closed before reopening around 11 a.m., MSU police Capt. Doug Monette said. No injuries were reported. The spill was largely contained to the room with the tanker, university spokesman Jason Cody said, but a small amount leaked into a basement aisle and into a storm sewer system. He added that the university contacted the East Lansing wastewater treatment plant. Scott House, the city's director of public works, said the city has been in contact with the university and has been running tests throughout the day with no negative impacts. Crews were still working Tuesday afternoon to clean up the spill, test the air and return the affected area to a safe condition for workers, university spokesman Jason Cody said. That process was expected to be completed Tuesday evening. The leak occurred in a flange on an outside line that brings the acid to the tank, although the leak occurred inside the power plant, Cody said. No disruption of power to the university was reported, Cody said. He added that while a majority of workers were evacuated from the building "out of an abundance of caution," the necessary control operations to keep the plant functioning weren't affected. The power plant can be run by five employees, but at any given time about 40 people can be working at the plant, he said. The power plant uses water, treated with sulfuric acid and other chemicals, in the power generating process, Cody said. The water in the power plant treated with chemicals isn't connected to the campus' other water systems, he said. The plant was not damaged, Cody said. Monette said the East Lansing Fire Department and MSU's Environmental Health and Safety staff were notified of the spill, which is standard procedure. The university was bringing in an abatement company to assist with the cleanup, Cody said. A hazardous materials response team was called to Chicago's Far South Side Sunday following a chemical spill. The Chicago Fire Dept. said 500 gallons of sulfuric acid spilled at a building in the 12200-block of S. Carondolet. Chicago firefighters were able to clean up the scene. There were no evacuations and no one was hurt. 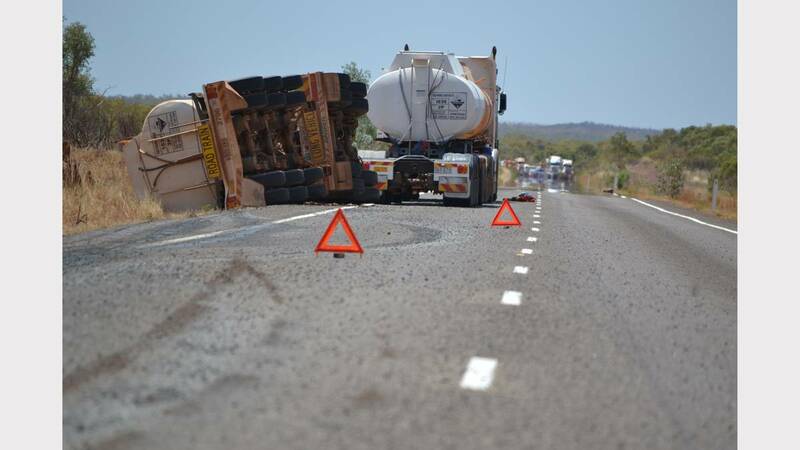 Spill March 22, 2016 Queensland A highway in northwest Queensland will reopen after a truck rolled and spilled 17,000 litres of sulphuric acid. The Flinders Highway at Maxwelton, near Richmond, was closed yesterday afternoon to allow authorities to clean up the hazardous material. The section of highway, between the Hopevale and Nondas West turn-offs, was expected to reopen at 6 o’clock tonight. “All of the sulfuric acid from the damaged tanks has been emptied out and a recovery crew is currently separating them from the prime mover,” police said in a statement. The prime mover and first tank would be driven from the site as neither were damaged, they said. The truck was carrying three tanks of sulphuric acid when it rolled. One leaked, prompting authorities to establish a 10km exclusion zone. The leak is just 100km from where an estimated 80,000 litres of sulphuric acid was spilt in a train derailment amid a drought-breaking deluge in late December. Environmental = Release February 18, 2016 Delaware City, Delaware, USA A toxic chemical was released into the air from the Delaware City Refinery, according to state environmental officials. The Delaware Department of Natural Resources and Environmental Control said the emission of 144 lbs. of sulfur dioxide happened Thursday, February 18, 2016 around 7:13 a.m. The gas, considered to be hazardous by the Environmental Protection Agency, and bears a pungent, irritating, and rotten smell. DNREC was investigating the incident. The quick actions of the Pilot Chemical Co. response team, and a steady breeze were credited for reducing the risks associated with a potentially dangerous chemical spill Thursday morning. Middletown Division of Fire Chief Paul Lolli said when his department was notified at 11:11 a.m. Thursday that sulfur trioxide had leaked from a tanker while the chemical was being transferred into the facility, the company’s response team had stopped the leak and contained it in a spill pit. Plus, Lolli said, the 5 to 10 mph winds blowing from the east helped dilute and push the plume of smoke off to the west and out of the area. Sulfur trioxide can cause serious burns on both inhalation and ingestion because it is highly corrosive, Lolli said. He said it should be handled with extreme care since it reacts with water violently and produces highly corrosive sulfuric acid. Lolli said if sulfur trioxide is breathed or comes in contact with skin it can cause “serious medical problems,” though no injuries were reported. Two hours after the leak was reported at 3436 Yankee Road, most of the emergency personal from the Butler County Hazardous Material Team, Middletown and Monroe firefighters and police officers had left the scene. Yankee Road was closed for more than two hours. Pilot officials said there were between 3,500 and 4,000 gallons of sulfur trioxide stored in the tanker. Lolli said “not a lot” spilled. When pressed on the amount by reporters, Lolli estimated less than 50 gallons escaped. He said one plume of smoke was visible after the sulfur trioxide exited the tanker. It’s unclear how the chemical leaked, and Lolli said a team of investigators from Pilot and the fire department will try to determine a cause. He said the investigation would begin once the spill was cleaned up. He didn’t have a timetable when the investigation will be complete. Middletown officials notified about 800 residents near Pilot Chemical about the potential dangers of the chemicals, and they were told to remain indoors. The Middletown City Schools District issued a sheltering in place for students and staff at Amanda Elementary on Oxford State Road, though concerned parents were permitted to pick up their students. The school is located about one mile from the plant. School officials said about 30 students were picked up early by their parents. Superintendent Sam Ison said all students were placed in the school’s cafeteria as a precaution. He said all windows at the school were closed and the HVAC system was turned off during the sheltering in place. An adverse reaction to a change in medication might have contributed to a semi driver hauling a tanker full of sulfuric acid driving into a ditch off Interstate 41 Tuesday in Washington County, the sheriff's office said. The driver began to feel dizzy and nauseous while traveling north in the left lane of the highway south of state Highway 60, according to a news release from the Washington County Sheriff's Office. According to the release, the semi, driven by a 54-year-old Greenfield man, veered into the right lane before entering the ditch. There was never any danger of leakage from the tanker, according to the sheriff's office. A recent change in prescribed medication for the operator is a possible contributing factor to the accident, according to the sheriff's office. The driver was not transported from the scene and there was no damage to the semi. The driver was given an inspection report and placed out of service until no longer ill, according to the release. January 22, 2016 - A truck driver was lucky to escape serious injury when his rig, loaded with sulphur, caught fire at Dyraaba near Casino. Newcastle Fire Communications shift supervisor Paul Randall said NSW Fire and Rescue Casino brigade was called to Sextonville Rd at 12.30pm today after reports a truck had caught fire. When fire fighters arrived at the scene they found it was no ordinary truck fire, as the burning eight-tonne rig was carrying three-and-a-half tonnes of sulphur, Mr Randall said. Reinforcements were called from across the Northern Rivers, with eight tankers called to the scene from Lismore, Goonellabah, Alstonville and Kyogle, and Hazmat units from Goonellabah and Tweed Heads. “It was very fortunate that when fire fighters arrived the truck driver had managed to get out of the vehicle and to safety,” he said. The Gavin Creighton’s Fertiliser Spreading truck spilled part of the sulphur, Mr Randall said, and burned for more than three hours as fire fighters battled the blaze and shifting wind conditions. “One minute fire fighters were upwind from the truck and the next minute the wind would swing around and they had to move the tankers and personnel to the other side of the truck,” he said. “Hazmat units monitored any run-off from the fire and also conducted atmospheric testing at the scene to make sure fumes weren’t affecting any nearby residents, because burning sulphur gives off very toxic fumes. January 20, 2016 - Three train cars carrying sulfuric acid have been placed back on the tracks under Interstate Highway 680 in Martinez and moved away from the area where they derailed Wednesday morning, according to firefighters. Contra Costa County firefighters announced via Twitter that all the cars had been put back on the tracks and the scene had been turned back over to the railroad company at 7:48 p.m. 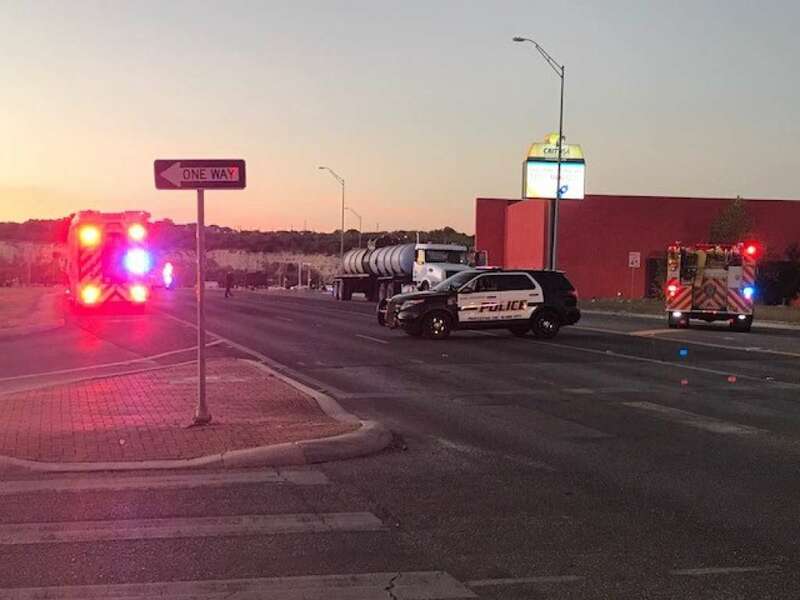 The tanker cars, which did not leak their contents, initially derailed under the highway near Marina Vista Avenue at about 7:30 a.m., Union Pacific Railroad spokesman Francisco Castillo Jr. said. Castillo said a Union Pacific crew delivered another company’s 20 train cars on Monday from its tracks to an industry line used by a company called Eco Services. According to county officials, the company removes certain substances from the acid. When the train was being moved, three of its tanker cars came off the tracks, Castillo said. One of the cars tipped over at a roughly 45-degree angle. County hazmat crews that initially responded determined the tankers were not leaking their sulfuric acid contents. Local activist Andrés Soto, a spokesman for Benicians for a Safe and Healthy Community, was at the scene this afternoon. “The whole community dodged a bullet,” he said, given that the sulfuric acid didn’t leak out. 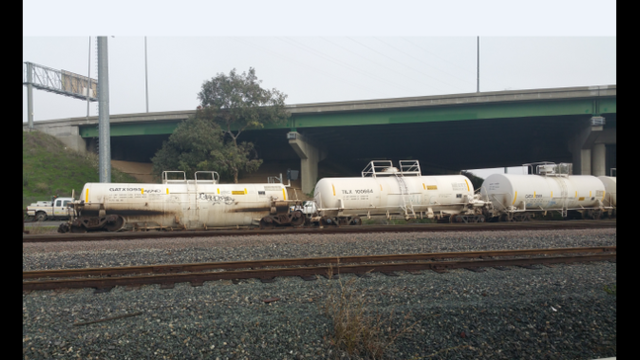 He called the incident a “near miss.” Soto, whose group is against a proposal to deliver crude oil by rail to a Valero refinery in Benicia, said this represents a warning sign. “Once again we learn transporting hazardous materials by railroads is a dangerous business,” he said. 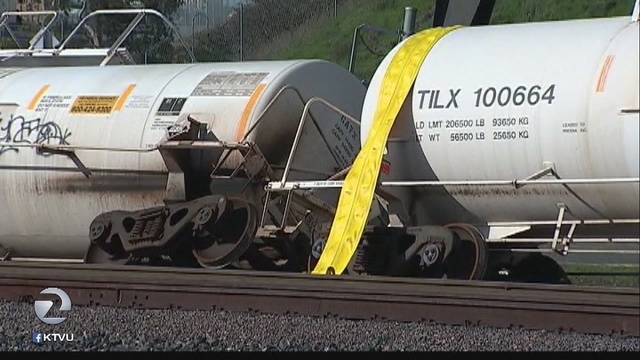 January 27, 2016 - Contra Costa County hazardous materials officials said today there are troubling aspects to a company's initial account of the derailment of sulfuric acid-filled train cars last week in Martinez. 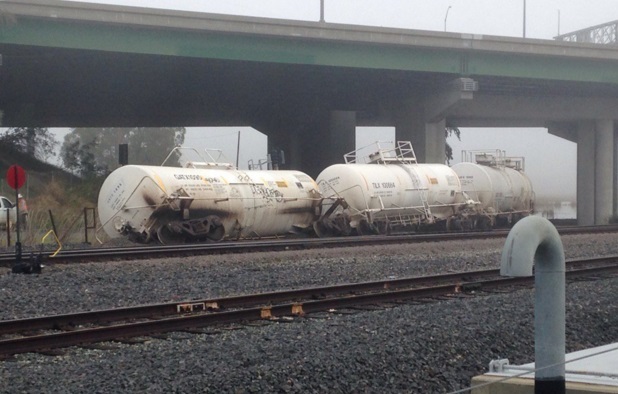 The three train tanker cars, which did not leak their contents, derailed near the Interstate Highway 680 overpass along Marina Vista Avenue at 6:45 a.m. on Jan. 20. The cars were part of a group of 12 that were separated from a 20-car delivery to a company called Eco Services on an industry line off of Union Pacific's main line, Eco Services officials said in a report. When the cars were separated on the tracks to be brought into the company's facility, they immediately started rolling south down a gradient. According to the report, three of the 12 cars eventually came off the tracks after striking a derail device that's meant to prevent a collision about 50 feet west of the highway's overpass. The report, which was filed Monday, was addressed to Contra Costa County's chief environmental health and hazardous materials officer, Randy Sawyer. Sawyer said it should be seen as concerning that the account of the incident may imply that there were cars filled with hazardous materials that did not have a proper braking system applied. Sawyer also pointed out, as the report itself does, that the company made no effort to contact his agency until shortly after 9:30 a.m., nearly three hours after the derailment. He added that the company was not legally compelled to report the incident to county hazardous materials officials, given that there was no spill. "Still, we would expect that they would notify us as quickly as they could, maybe within 15 minutes," Sawyer said. Eco Services, a company that removes certain substances from sulfuric acid as part of the oil refining process, was not immediately available for comment. According to the company's report, it alerted Union Pacific to the incident within around 15 minutes. All the cars were put back on the tracks without further issues by 7:35 p.m. that day. But the derailment was something that environmental advocates, including Benicians for a Safe and Healthy Community and the local chapter of the Sierra Club, considered a "near miss." The activist groups saw the incident as a reminder of the potential dangers of delivering crude oil products by rail. "Every Bay Area resident needs to contact their local representatives and make sure they take a stand against extreme crude by rail," Ratha Lai of the Sierra Club's San Francisco Bay Chapter said in a statement last week. Sawyer didn't go as far as calling it a near-miss, given the type of materials involved and the lack of a spill, but said he is following up with other agencies to learn more about why it occurred. The California Public Utilities Commission is investigating the incident, commission officials confirmed today. The agency regulates privately owned rail transit, among other things. CPUC officials said they are not releasing any information about the investigation at this time. Officials at Pacific Union, which is also helping to conduct an investigation into the incident, were also unable to provide further details. 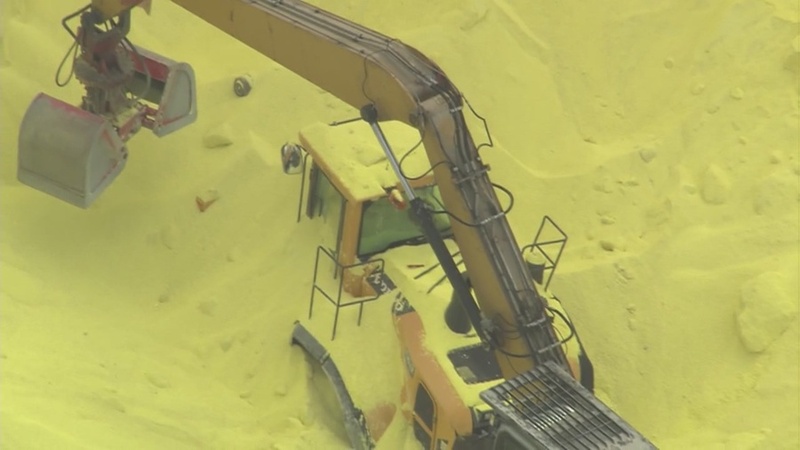 Authorities say a worker was killed at a Port Tampa Bay site when a giant pile of sulfur collapsed on his front-end loader. 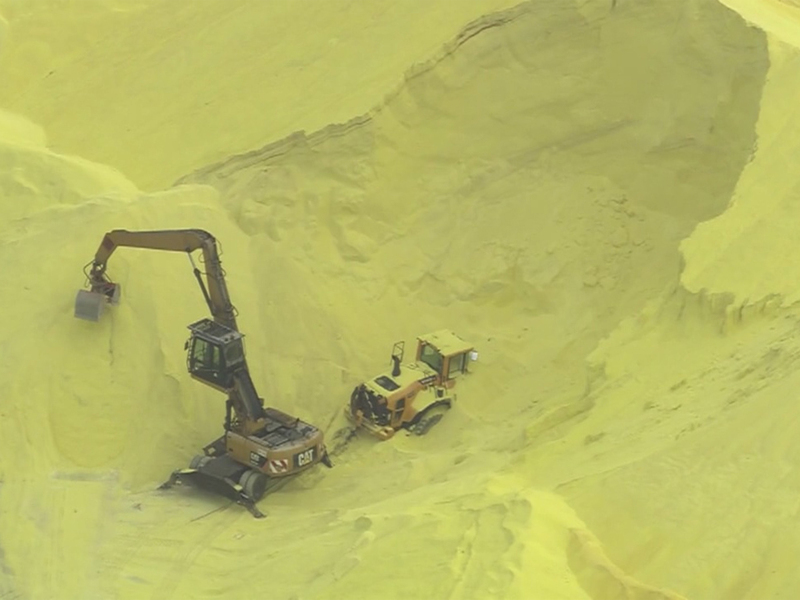 Hillsborough County Sheriff's Office spokesman Larry McKinnon told local media outlets that the Gulf Coast Bulk Equipment employee was moving sulfur to a semitrailer at the Port Redwing site Friday morning when the 30-foot pile collapsed. Hillsborough County Fire Rescue spokeswoman Nacole Revette said the man, who wasn't immediately named, likely died from inhaling the sulfur, but no official cause of death has been released. She said firefighters had to work carefully to remove the body so they wouldn't cause another collapse. Revette says rain Friday morning kept the sulfur from forming a cloud and possibly endangering the surrounding area. The Occupational Safety and Health Administration will investigate. 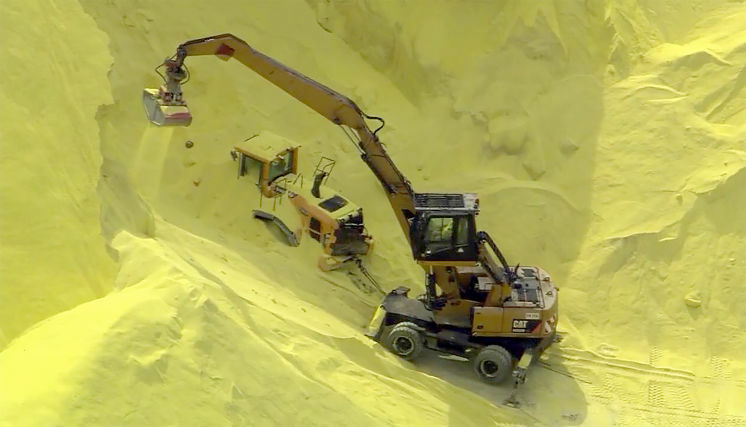 When a 30-foot mound of sulfur fell in a yellow avalanche and engulfed Joe Lammlein as he was working in a front-end loader Friday, his own brother tried to dig him out. 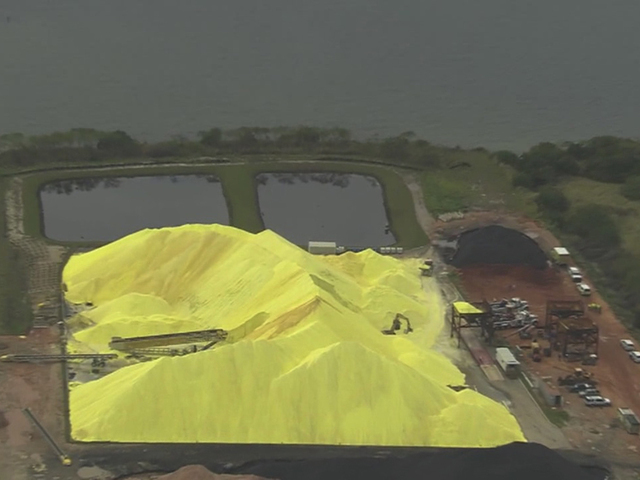 Three responding deputies and other workers also dug, desperate to save the 45-year-old worker trapped in a sulfur pit at Port Tampa Bay. But they couldn't help him. Lammlein died trapped inside the buried front loader at Port Redwing off Wyandotte Road. It took about four hours for rescuers to recover his body, according to the Hillsborough County Sheriff's Office. On Friday evening, Lamm­lein's family was in mourning. Two brothers worked there Friday. Oldest brother George Lammlein said middle brother Mike was working on the other side of the sulfur pile. It was shortly after 10 a.m. The pile toppled onto the youngest brother, Joe Lammlein, after he went to scoop up sulfur and move it into a semitrailer truck. "It could have happened to either one of them," said George Lammlein, 54. Joe Lammlein of Palmetto likely died from inhaling the sulfur, said Hillsborough County Fire Rescue spokeswoman Nacole Revette. She said sulfur that is inhaled sticks to the lungs. The investigation into the death is ongoing; no official cause of death had been made public. "(It was) a freak accident at work," Revette said. "It's hard for the co-workers who have to sit there and watch everything." Joe Lammlein was an employee with Gulf Coast Bulk Equipment for about five years, his oldest brother said. 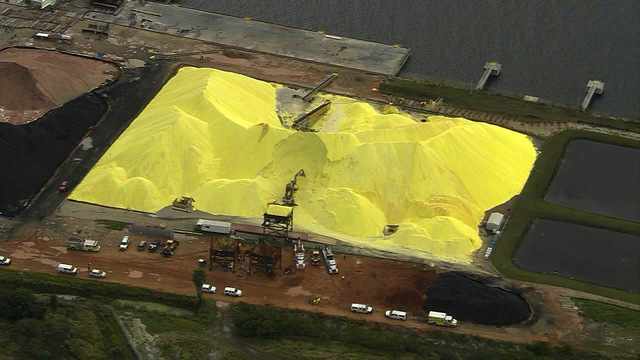 According to a Tampa Port Authority news release from March 2015, the Palmetto company signed a six-year lease with the port to handle prilled sulfur imports on a 5-acre parcel at Port Redwing. Revette said rescuers were able to reach the driver's seat of the front loader to confirm the driver had died. She said crews had to work carefully to remove the front loader to prevent causing another collapse. A representative for the company could not be reached for comment. The Lammlein family said the company has offered to pay for funeral costs. 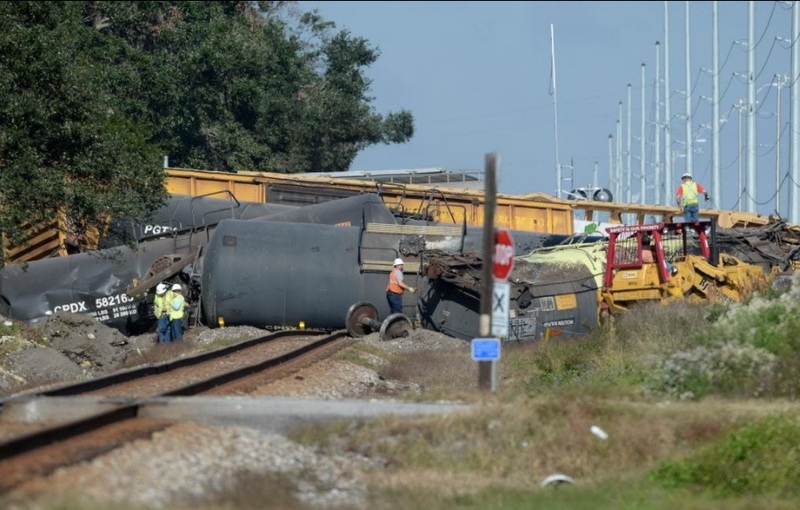 The Occupational Safety and Health Administration will investigate the accident, said Tampa area director Les Grove. Investigators will determine if the work site was at fault in the accident, and if so it could be cited and fined, Grove said. George Lammlein described brother Joe as kind, caring and a devoted worker. "He would have done anything for anybody," he said. The NSW Environment Protection Authority has confirmed 6000 litres of sulphuric acid entered the stormwater system draining into Lake Liddell following a pollution incident at Bayswater Power Station. On Christmas Eve Fairfax Media reported AGL Macquarie had been issued two penalty notices in December totalling $30 thousand for breaches of the Protection of the Environment Operations Act. AGL Macquarie Pty Limited operates Bayswater Power Station near Muswellbrook and uses Lake Liddell to provide cooling. The environmental watchdog said in November the Authority was notified of a low pH reading in Tinkers Creek by AGL Macquarie. It said further investigation revealed a failed isolating valve caused sulphuric acid to enter two stormwater drains, resulting in a discharge to Tinkers Creek. One of the penalty notices has been issued for failing to maintain equipment in a proper and efficient manner. The environmental authority imposed the second penalty notice because AGL Macquarie had breached the pH limits prescribed by its Environment Protection Licence, which authorises operations at the Bayswater Power Station. It also issued official cautions to AGL Macquarie for polluting waters and for failing to carry out licensed activities in a competent manner. Hunter Region Manager with the Environmental Protect Authority, Adam Gilligan, said it reacted promptly to the pollution incident. “While Macquarie AGL did the right thing by notifying us as soon as they noticed the issue, pollution of waters is taken very seriously by the EPA,” he said. "[That] is why two fines and official cautions were issued in this instance. In August, AGL Macquarie was issued with a separate $15,000 penalty by the EPA. On that occasion, the penalty notice related to an April incident where AGL Macquarie admitted responsibility for discharging between 50 and 100 litres of water contaminated with ammonia into Tinkers Creek. The April incident occurred during a re-certification of a bulk ammonia tank. 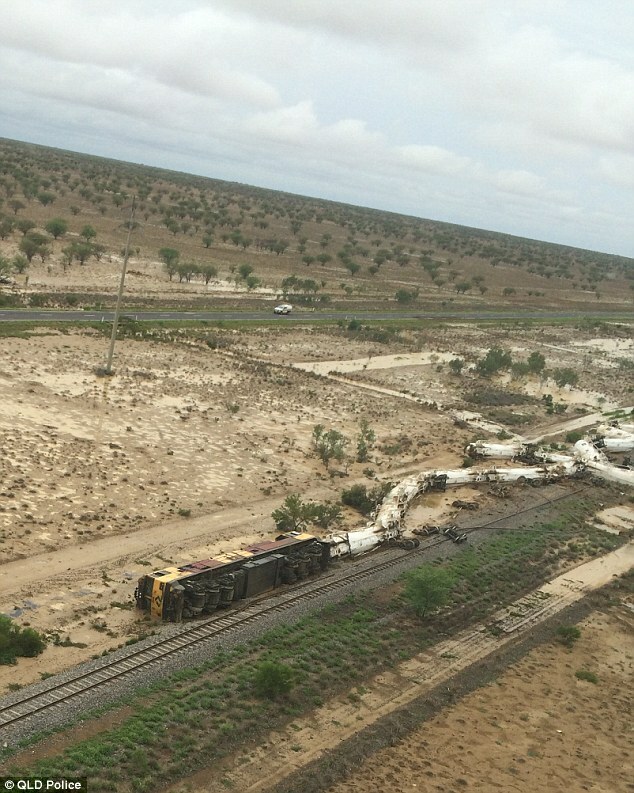 The locomotive and all 26 carriages derailed at 10:20am about 20 kilometres east of the outback town. Authorities declared an emergency under the Public Safety Preservation Act and placed a two-kilometre exclusion zone around the crash site. They said there was minor leakage of sulphuric acid and diesel fuel spillage at the crash site. Aurizon said three drivers sustained minor injuries in the accident and attended the Julia Creek hospital. "Two drivers have been released and the third is expected to be released later today," an Aurizon spokesperson said on Sunday. "At this early stage, the cause of the incident is not known. Both Aurizon and Queensland Rail will investigate the incident and determine its cause. "At this time the focus is on recovery of the incident site." The Flinders Highway has been closed in both directions between Julia Creek and Richmond. Queensland Rail said it was unclear how long the train line would remain closed. Julia Creek Hotel publican David Wyld said the locomotive went into the bore drain after it rolled and ended up underwater. "So that would've pulled off all the whole 26 carriages with sulphuric acid," he said. Mr Wyld said the road was blocked by rail workers immediately after the accident. "The police and all that couldn't get to it, blocked the whole road off straight away," he said. "And you could smell the sulphuric acid where they actually blocked it off." Queensland Rail works to access site. A spokeswoman from Queensland Rail said wet weather had flooded local roads, so they had not been able to get anyone on site to assess the damage. "We are looking at alternate ways to get Queensland Rail crews to site," she said. "Passenger rail services have been cancelled. The Inlander has been cancelled today and tomorrow from Townsville to Mount Isa. "Updates on passenger services will be made as soon as they are available." Aurizon said interim arrangements had been put in place to maintain site safety until the status of the derailed wagons and any product spillage could be confirmed. December 29, 2015 - It was feared more than 30,000 litres (7,925 gallons) of sulphuric acid had spilled after all 26 carriages of a freight train carrying the chemical derailed in remote northern Australia, authorities said on Tuesday.The train, belonging to locally listed freight firm Aurizon Ltd, was carrying about 819,000 litres (216,360 gallons) of sulphuric acid, four times the amount first estimated, when it derailed in Queensland state on Sunday. "One of the carriages has likely ruptured and it is possible that up to 31,500 litres of acid has leaked out," Queensland Police said in a statement.Testing by the Department of Environment and Heritage Protection suggested that a nearby waterway had not been adversely affected by any leak, the statement said.Aurizon said in an email to Reuters the cause of the incident was not yet known. Three train drivers had received minor injuries but had been released from hospital, it said.A derailment and chemical spill adds to pressure on the haulage company after a downturn in coal shipping volumes forced it to issue a profit warning last week, sending its shares sharply lower.It would also disrupt mining companies already slashing production volumes to cope with weak commodity prices. Miners use sulphuric acid to separate and clean some minerals.The train was traveling from the east coast port city of Townsville to Phosphate Hill, 1,000 km (620 miles) inland, Aurizon said.The police statement did not give a cause for the derailment but said the area had experienced flooding, causing a nearby highway to be cut off.Police said they had formed a 2-km (1.2-mile) exclusion zone around the crash site to help salvage crews gain access. January 2, 2016 - A temporary track will be built around the accident site after a train that was carrying more than 800,000 litres of sulphuric acid derailed in Queensland’s northwest. A highway near a freight train that derailed in Queensland’s northwest has reopened almost a week after the accident, and a temporary track will be built to bypass the site. 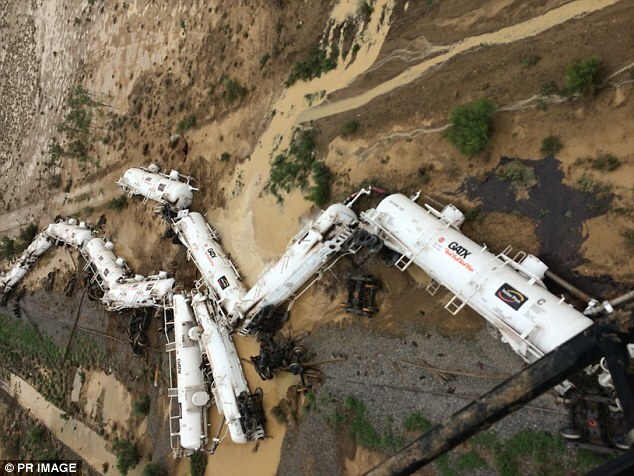 The train was carrying more than 800,000 litres of sulphuric acid, of which about 31,500 litres spilled when all 26 of the train’s wagons overturned near Julia Creek last Sunday. An exclusion zone around the site was reduced on Saturday afternoon, allowing the Flinders Highway to open. 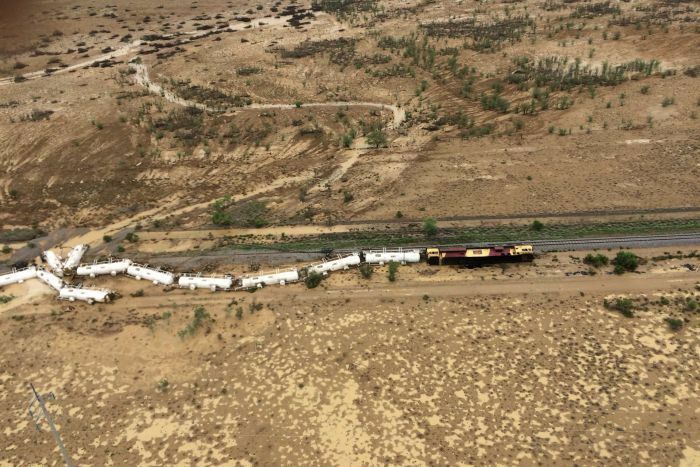 “While there is no danger for people travelling on the Flinders Highway past the derailment site, police will enforce a reduced speed of 40km/h,” Queensland Police said in a statement. An area of 50 metres all around the train will remain cordoned off and aircraft are banned from flying above the site. 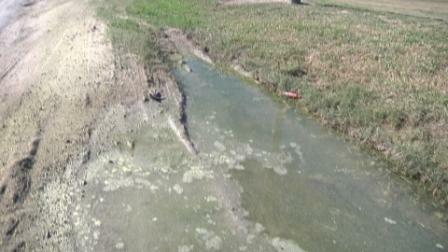 Specialists are continuing to monitor water quality in the area. The Department of Environment and Heritage Protection said earlier this week it held concerns about acidity levels in nearby Horse Creek and was looking at ways to neutralise the acid. January 5, 2016 - Sulfuric acid may have leaked from a second wagon on a train that derailed in Queensland's northwest more than a week ago. 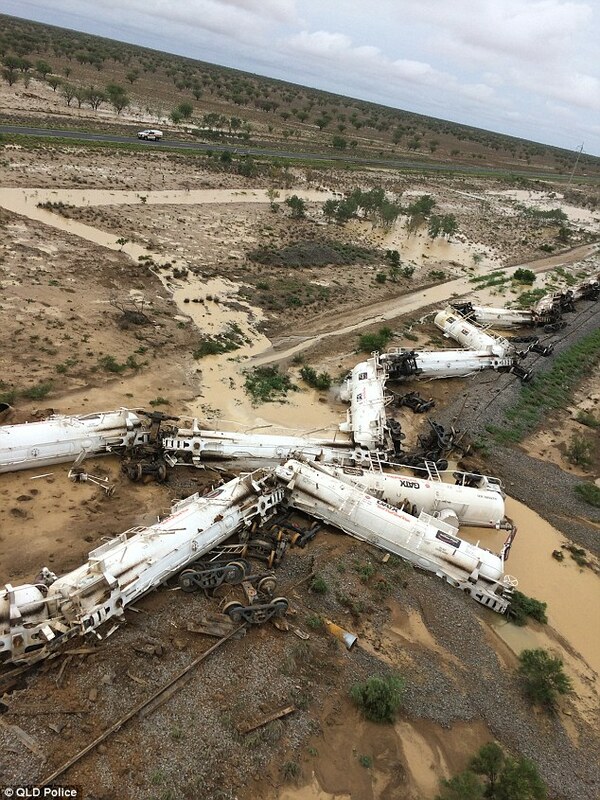 The train was carrying more than 800,000 litres of sulfuric acid when all 26 wagons derailed near Julia Creek on December 27. It was initially estimated that 31,500 litres had spilled from one wagon, but it has become apparent a second wagon may also have a minor leak. "Queensland Rail's Incident Rail Commander was yesterday (Tuesday) advised by Incitec Pivot that one additional wagon may also have a very minor leak, which is being treated on site," the company's chief executive Helen Gluer said. Water testing around the crash site came back positive for the toxic chemical at Horse Creek, a small slow-flowing waterway, prompting authorities to neutralise the acid. Ms Gluer said Queensland Rail had appointed a consulting company to undertake an environmental monitoring program and to provide expert advice about any environmental impacts. The Mount Isa line remains closed, with the locomotive and 26 wagons on their side. Wet conditions have hampered recovery efforts and the construction of a temporary track around the crash site. Recovery crews are building access roads from a nearby highway to the railway so heavy machinery can access the site. "Construction of the deviation has unfortunately been delayed due to wet ground conditions around the site. However, with water beginning to clear we expect to complete the deviation late next week," Ms Gluer said. The Inlander service has been replaced by buses, while freight trains are only running between Mount Isa and Phosphate Hill. January 8, 2016 - Construction has begun on a temporary track around the site of a derailed train in Queensland's northwest. The train was carrying more than 800,000 litres of sulfuric acid, of which about 31,500 litres spilled, when all 26 of its wagons overturned near Julia Creek on December 27, closing the Mount Isa line. The closure has created a backlog of freight services and forced the Inlander service to be replaced by buses. Wet conditions have hampered the recovery but construction of the 800-metre bypass began overnight on Thursday. Queensland Rail's Michael Mitchell said more than 50 staff would work around the clock building the track in a bid to re-open the line as soon as possible. "Conditions permitting, we expect construction and certification of the rail deviation to be complete middle of next week," he said. The sulfuric acid spillage has also caused environmental headaches. Water testing around the crash site came back positive for the toxic chemical at Horse Creek, a small slow-flowing waterway, prompting authorities to neutralise the acid. It was initially estimated that 31,500 litres had spilled from one wagon, but this week it became apparent that a second wagon may also have a minor leak. Queensland Rail has appointed a consulting company to undertake an environmental monitoring program and to provide expert advice about any environmental impacts. January 12, 2016 - Train services have resumed on the Mount Isa line after a major derailment which spilt thousands of litres of sulphuric acid in north-west Queensland. Queensland Rail crews spent the past five days constructing an 800-metre temporary deviation around the 26-wagon train, about 20 kilometres east of Julia Creek. 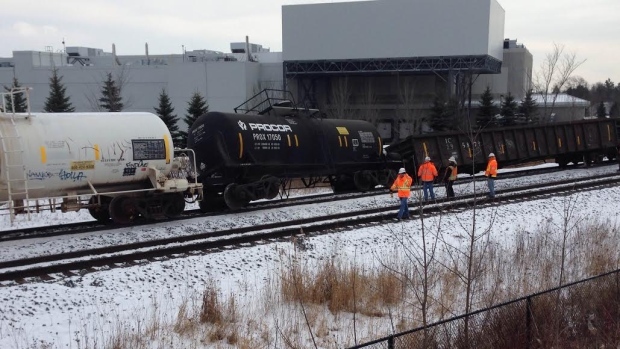 The train was carrying 819,000 litres of sulphuric acid when it derailed on December 27. One of the carriages ruptured, spilling up to 31,500 litres of the acid, some of which made it into the waterways. The derailment forced Queensland Rail to suspend all services between Mount Isa to Townsville. Queensland Rail's Rebecca Masci said the deviation was likely to be in place for a number of months. "We're talking about 3,000 tonnes of rock or ballast on this track and a thousand sleepers, so there's a lot of grunt work that actually went into delivering this deviation quickly," she said. "This is a really tricky site and we have to approach everything with the utmost care to make sure that as we move forward we do it as quickly as possible. "But it needs to be done safely for the people on site as well as, most importantly, not causing any further impact to the environment." Constructing the deviation also involved more than 2,000 tonnes of road base and 1.6 kilometres of rail line. The first freight train travelled over the rail deviation at 6:20pm Wednesday and the first Inlander passenger service is due tonight. Transport Minister Stirling Hinchliffe said about 50 Queensland Rail staff worked on the temporary track. "We know communities in the north west rely on the Mount Isa line for passenger services and to transport freight," Mr Hinchliffe said. "Constructing this deviation and resuming trains as quickly and safely as possible has been one of our highest priorities." Queensland Rail appointed Golder Associates last week to monitor the environment around the derailment and to ensure the deviation could be constructed safely. Work continues to remove the derailment wreckage. February 9, 2016 - A north-west Queensland cattle producer whose dam was contaminated by sulphuric acid during a train derailment is asking for ongoing water and soil testing to ensure his land is left in a healthy state. Police estimated up to 31,500 litres of acid spilled from a 26-carriage freight train after it came off its tracks east of Julia Creek on December 27. 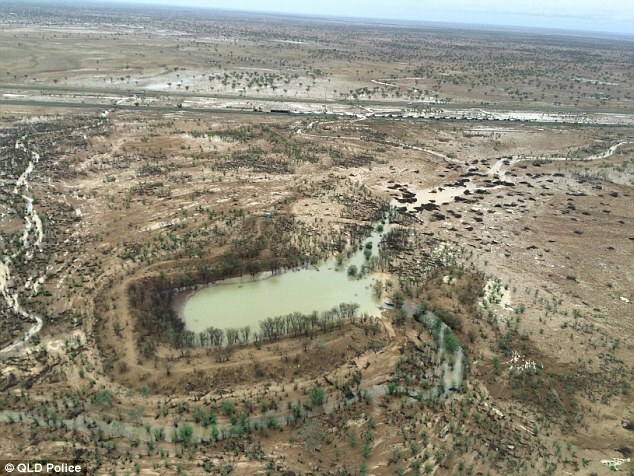 A dam on Garomna Station, owned by Nigel Simmons, was contaminated by the acid spill and has been off limits to livestock since the incident. He expected the acid to be neutralised by January 22, but said works to mix his dam water with agricultural lime to bring the PH level up were taking longer than expected. Mr Simmons said he had not asked for compensation, but wanted the companies involved in the derailment to "fix the mess they've made". "At the end of the day we just want a dam we can use and country that still grows grass," he said. "And, for the long term too, we're expecting them to maintain checks on the water throughout the year, making sure it is still usable for cattle. "Nothing is in writing but I've said all along that's what I want and they've always said that's what they plan to do with the follow up. "I guess when they're finished or close to being finished we'll get something in writing so they will be back to maintain it." Queensland Rail (QR) said it had made a commitment to continue testing affected land and water on Garomna Station and other areas around the derailment. Three companies have been involved in the clean-up effort since December. QR owns the rail line, Aurizon owns the locomotive, and fertiliser manufacturing company Incitec Pivot (IPL) owns the carriages and the sulphuric acid involved in the spill. QR corporate and customer relations manager Rebecca Masci said all three companies were working on a remediation plan to make sure the site was returned to its original condition. "Queensland Rail will absolutely be remaining on site until the whole landscape has been brought back up to its appropriate PH levels and I know that IPL is very much committed to the remediation of Mr Simmons' dam as well to bring that back up to the appropriate PH level," she said. "We will absolutely remain committed to continue to test over time, not only Mr Simmons' dam but also the whole area out there that has been impacted, so that it remains healthy over a period of time. "If there was any unusual activity in terms of the PH level, that continual testing would mean we'd be able to treat that immediately.Ms Masci said the acid and Aurizon locomotive were no longer at the crash site, and the remaining train carriages should be gone within days. She also confirmed IPL was still working to rehabilitate the dam water at Garomna Station. "The reason that its taken longer than one might have hoped for is because we have to be very careful about the process of bringing the PH back up to that mid-range of around 6.5 to 8.5 which is suitable for cattle to drink from," Ms Masci said. "They go through a process of mixing agricultural lime into a slurry, for want of a better term, and they then inject that into the dam and each day and they gradually bring it up to a healthier level so that, over time, it comes back to that mid-range." No other vehicles were involved in the incident and the driver was not injured, according to the RCMP. Emergency personnel, including hazmat teams, have been dispatched to the scene. One crew was reported to have come from Kings County to assist in the cleanup. Provincial RCMP spokesperson Craig Burnett said the section of highway would be closed for several hours as the spill is cleaned up, well into this evening. The RCMP had originally said that the tractor trailer tipped and some barrels containing the sulphuric acid were punctured, and tweets that were sent out by the RCMP referred to a "crash" having occured. Later on Twitter the RCMP said an investigation had determined that a crash did not occur, but that the "Tractor trailer driver noticed issue with load and parked." The RCMP later said the spill occurred from a leaking barrell that was in an enclosed trailor. It had come loose. The truck was carrying several barrells of sulphuric acid. There was no official media release about the incident issued by the RCMP on Monday. The highway was closed betweens Exits 30 near Barrington and Exit 32 near Argyle from Monday afternoon until late Monday night. While the section of highway was closed traffic was being rerouted to Route 3. - The railway officials would assess the damage to the bridge after the barge was disengaged from the bridge. Senior officials of Inland Waterways Authority of India (IWAI), FACT officials and officials of the company that operates the ferry service inspected the site. The barge hit the base of a column which remained submerged as the crew tried to maneuver under the railway bridge and got stuck there. KOCHI: A barge ferrying sulfur to FACT rammed into a column of Kaniampuzha railway bridge in the early hours on Saturday and got trapped, forcing the Railway officials to impose speed restriction in the Ernakulam-Kottayam route. In the wake of the accident, a speed restriction of 30 km per hour on trains in the route were imposed by the Railway officials. KOCHI: A barge ferrying sulfur to FACT rammed into a column of Kaniampuzha railway bridge in the early hours on Saturday and got trapped, forcing the Railway officials to impose speed restriction in the Ernakulam-Kottayam route. Consequently, many trains passing through this stretch got considerably delayed. The barge hit the base of a column which remained submerged as the crew tried to maneuver under the railway bridge and got stuck there. Efforts continued on Saturday night to free the barge. The officials hope that the attempts would be successful during high tide as earlier efforts to extricate the barge using other vessels failed. In the wake of the accident, a speed restriction of 30 km per hour on trains in the route were imposed by the Railway officials. According to officials the trains were delayed over 10 minutes during peak hours. Senior officials of Inland Waterways Authority of India (IWAI), FACT officials and officials of the company that operates the ferry service inspected the site. The railway officials would assess the damage to the bridge after the barge was disengaged from the bridge..
Atmore firefighters spent more than five hours battling a chemical fire at Sunbelt Chemicals on Saturday. AFD Chief Ronald Peebles said the fire department arrived on scene at 8:50 a.m. and finished up at 2:30 p.m. Peebles said the fire started when a side grinder caused a spark to catch some sulfur dust on fire. “With that sulfur dust, it’s funny to deal with,” Peebles said. “You can put it out in one spot, and then it’ll pop up in another.” Peebles said sulfur dust is fine dust that can spread easily, and when burning produces a chemical gas that is bad for breathing. “It sporadically can jump from place to place,” he said. The fire was inside of an office building inside of a larger building, Peebles said. Peebles said the fire turned into a hazmat situation pretty fast. “It had to be treated delicately and slowly,” he said. “Then, we spent a lot of time making sure we had everything possible out so we didn’t have a rekindle on it. “It could’ve turned into one nasty monster,” he said. “The guys did a heck-of-a job handling the fire.” Because breathing became an issue, the AFD used 44 bottles of air to quench the fire, Peebles said. “On a normal house fire, we may go through five,” he said. Peebles said there was one person injured, adding that he had an allergic reaction to the sulfur. “He was sent to the hospital, and he’s going to be fine,” he said. Peebles said the condition of the structure is alright, and the fire more or less burned the insulation on top of the complex and messed up one of the A/C systems. “It could’ve been an ugly situation if they couldn’t have handled the fire the way they did,” he said. Company officials say there'll be some temporary production changes after a chemical leak in Terre Haute last weekend. Last week more than a dozen people were treated at a hospital after the leak at Hydrite Chemical Co.Firefighters at the scene said sulfur dioxide had leaked and winds carried fumes to nearby Hulman-Mini Speedway, where a crowd was watching auto races. Many people were evacuated from the area and some complained of respiratory problems including difficulty breathing, nasal irritation, as well as nausea and a metallic taste in their mouths.WTHI in Terre Haute reports that Hydrite will stop production from a piece of equipment that leaked during races.The closures will run from noon to midnight on race days. Spill July 24, 2015 Indian Orchard A 500 to 1,000 gallon spill of sulfuric acid at the Masspower facility in Indian Orchard has been cleaned up and is being monitored, according to the state DEP and the plant's owner.On July 7, Masspower workers reported a leak from piping connected to a sulfuric acid tank into a containment area, according to documents filed with the DEP. Masspower estimated that 500 to 1,000 gallons escaped the tank, and hired a contractor to begin a clean-up after reporting the incident.A spokesman for Dynegy, the Houston-based energy company that owns the facility, said the leak was reported and cleaned up in accordance to regulations with no exposure to the outside environment. "It was identified by a plant operator making normal rounds. Plant personnel followed all emergency response plans already in place. Mass DEP was notified immediately, as well as the Springfield fire department," spokesman David Onufer said. "You never like to see these things, but this was handled best as it could be. "The acid was contained to the facility, DEP spokeswoman Catherine Skiba confirmed. A containment room and an attached wastewater tank were contaminated have been cleaned up. The company reported no injuries to workers in a report to the DEP. "They did conduct the cleanup and they are conducting environmental monitoring to protect the safety of personnel," Skiba said.The cause of the leak was an elbow pipe connected to the bottom of the tank, which has been replaced, Onufer said.The Masspower facility, near the banks of the Chicopee River on Worcester street, is a 264 megawatt electric plant fueled by natural gas and has operated since 1993, according to regulatory filings with the DEP. 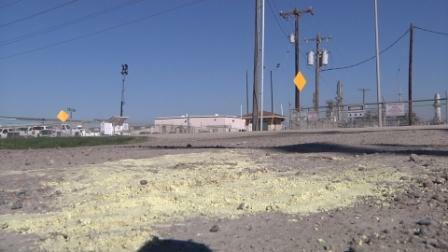 Spill July 20, 2015 Ector County Ector County officials are working to clean up a sulfuric acid spill from Sunday afternoon.The spill occurred around 3:30 p.m. Sunday at 220 S. Proctor Ave. Officials with the Ector County Attorney’s Office said the spill occurred when the acid was being transferred from a train to storage tanks at a local business.A hose used to transfer the acid reportedly ruptured causing the spill, officials said.County Attorney Dusty Gallivan said that right now they are waiting for a team from Houston to arrive and assist in the clean up.The spill was contained Sunday night, and officials are estimating a cleanup time of two to three days. 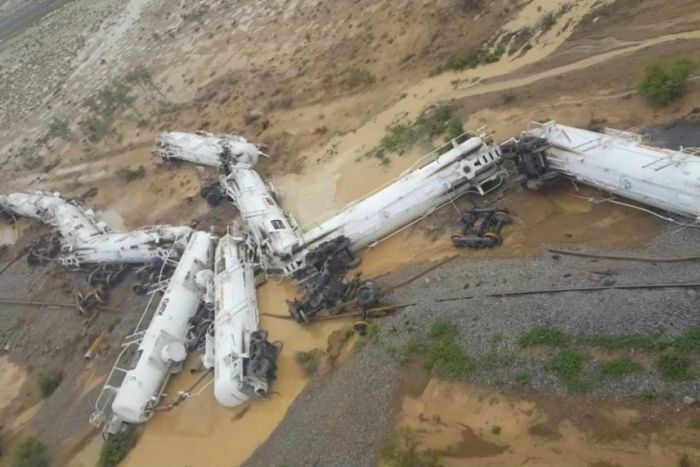 It never rains but pours for the national railway carrier of Namibia, TransNamib as earlier this week Train 2703 with two Class 34 locomotives carrying a load of 20 sulphuric acid tankers set for Rio Tinto's Rössing Uranium mine derailed at point 176 en-route from Walvis Bay to Arandis. According to TransNamib's executive spokesperson, Struggle Ihuhua no injuries were recorded but as a result of the incident, normal passenger and freight rail traffic from Walvis Bay to both Windhoek and the north will be affected and further information as per development on the scene will become available later. "Emergency response and accident investigation teams are on the scene to assess the cause of the accident, to assess the losses suffered and to speedily restore operations to normal," he added.Meanwhile, Rössing Uranium mine spokesperson Botha Ellis in a statement said the incident was managed promptly according to set emergency procedures and practices by all relevant parties. "Our team of experts was also on the scene to give support and assistance, ensuring that all was done in a safe manner. We are told that the rail will be repaired this week," he added.The Rössing Uranium mine, about five months ago experienced a snag after incurring damage from fire on its Final Product Recovery (FPR) plant.On this week's accident, Botha said, "the current incident does not impact our production as we have adequate amounts of sulphuric acid stored on site to continue with normal operations. 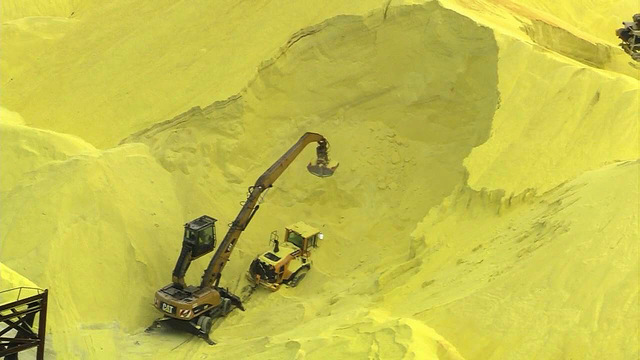 Sulphuric acid is used in Rössing's extraction process to produce uranium oxide. "Rössing's Uranium is made up of the following shareholders. The British-Australian mining conglomerate, Rio Tinto Group holds a 69%, the Iranian government 15% while the Namibian government holds 3%. The derailment of two TransNamib locomotives and a tanker carrying about 25 000 litres of sulphuric acid behind the dunes near Walvis Bay last week was caused by the presence of “sand on the tracks due to the strong east wind”. This was the explanation given in a response from the parastatal to The Namibian. The derailment also resulted in a limited spill of the acid used in the leeching of uranium ore. The train was pulling 20 tankers carrying about 460 000 litres of sulphuric acid to Rio Tinto's Rössing Uranium mine near Arandis. “This was an unfortunate incident which we had no control of. However, the spill was minor and was handled in accordance with the regulations by Rössing Uranium's hazard team,” read the response from TransNamib's senior spokesman Struggle Ihuhua. Fortunately no one was injured in the accident, although unverifiable damage to infrastructure included “cosmetic to serious damage” to the two locomotives and to about 300 metres of track. “Our business has been affected. We lost three nights of transporting, because no trains moved out of Walvis Bay and all our customers were affected,” he concluded. The port of Walvis Bay is a logistics hub through which most of the bulk imports and exports pass. Inquiries to Rössing Uranium were redirected to TransNamib. In December 2012 two locomotives and 17 wagons carrying manganese derailed on the line near the site of the latest derailment. That accident cost TransNamib over N$65 million. The accident was said to have been caused by a section of track that was damaged by a truck that got stuck while crossing the railway line. Little or no strong easterly winds were recorded during the time of the accident although strong south westerly winds, which could have carried dune sand over the tracks prevailed. The Minister of Environment and Tourism (MET), Pohamba Shifeta, has not ruled out the possibility of laying criminal charges against TransNamib management, for allegedly failing to comply with the Environmental Management Act of 2007.This follows the recent derailment of a goods train in the Dorob National Park, transporting toxic acid from Walvis Bay to Rössing mine.Cargo wagons overturned due to sand on the railway tracks, causing sulphuric acid to spill in the park. The incident raised the hackles of the MET as the custodian of Namibia’s natural environment. Sulphuric acid is a very corrosive and poisonous chemical.Shifeta said although TransNamib was issued with an Environmental Clearance Certificate (ECC) in 2014, which is valid for three years, they failed to inspect the railway to ensure the passage of the dangerous substance would be safe, which is required in terms of the law.“I was informed that TransNamib management apparently does not do inspections,” he stated.“The area is sensitive because of sand dunes. The rail should be inspected to ensure it’s clean before transporting any chemical,” he added.He said it’s high time Namibians take the Environmental Management Act seriously, adding that culprits breaking the law would be dealt with and have to “face the music”.“We will not leave any stone unturned. Anyone or any company found wanting will be taken to task. I want to warn the board of directors that they have a duty to take care of the environment and not endanger the lives of Namibians,” he said.He would however not say whether a criminal case would be opened against TransNamib.“The possibility of criminal charges against the company is there. People who are responsible will be fined depending on the extent of damage to the environment.If gross negligence is found against individuals, it can be transformed into criminal charges after investigations are done.They can be taken to task depending on whoever was responsible,” Shifeta said.Rail inspection is one of the conditions stipulated in the Environmental Plan.When environmental officers arrived at the scene of the derailment, TransNamib was already busy rehabilitating the area, he said. Spill July 11, 2015 Ebenezer, Saskatchewan Twelve homes were evacuated Friday after a CN train derailed just north of Yorkton.A dozen rail cars jumped the tracks near Ebenezer, Sask. around 1:50 p.m. Four of the cars were carrying liquid sulfur; seven were carrying cement, and one was empty.A CN Rail spokesperson told CTV News that some liquid sulfur leaked.No one was injured, according to RCMP, but a dozen homes were evacuated as a precautionary measure.Residents were allowed back in their homes late Friday evening.Some roads were blocked in the area as CN police investigated.Crews were still cleaning the spill and repairing the track on Saturday. A CN spokesperson expected the track to re-open later in the day. Spill July 10, 2015 Beulah, North Dakota North Dakota Transportation Department officials have closed state Highway 49 near Beulah due to the crash of a semitrailer hauling sulfuric acid. Highway Patrol Lt. Tom Iverson says acid spilled in the ditch about 4 miles south of Beulah. He says it's unknown how much spilled and if there's any environmental damage. The unidentified driver was taken to a Hazen hospital with unknown injuries. No other vehicles were involved, and it's unclear what led to the crash. Iverson says the highway likely will be closed for some time as hazardous material crews clean up the spill. Fire June 30, 2015 Dartmouth, Nova Scotia A Halifax fire division commander says the public was not in danger when a fire broke out at the former Imperial Oil refinery in Dartmouth Tuesday night.Chuck Bezanson says crews were called around 8:30 p.m. Tuesday to deal with an "elemental sulphur pile" that was burning on the grounds. An elemental sulphur pile is produced as a byproduct of refining oil and natural gas.Bezanson says the sun dried out the pile and it ignited.He says there was no danger to the surrounding neighbourhood.Four fire crews responded to the call and by 9:45 p.m. The fire was extinguished more than an hour later. Imperial Oil closed the Pleasant Street refinery and converted it into a marine terminal in 2013. A Chinese national suffered severe burns all over his body after he was splashed with sulfuric acid, following a tank explosion at a fertiliser factory in Port Klang. Selangor Fire and Rescue Department operations director Mohd Sani Harul said the 40-year-old man was working near the tank which was in operation at the time, at about 4pm Saturday, when it suddenly exploded and spewed acid all over. The man was covered in the corrosive acid from the neck down and suffered severe burns. “Our officers rushed there to clean the acid off him with a water hose. He was half conscious at the time and is in very critical condition,” Mohd Sani said. The man was rushed to the Tengku Ampuan Rahimah Hospital. The Fire Department is trying to contact the factory supervisor to ascertain what could have caused the explosion. Exposure June 15, 2015 North Lincolnshire AN incident at an oil refinery "could have been avoided" had hazards been identified which led to a worker needing skin grafts. The firm in question, Total Lindsey Oil refinery in North Lincolnshire, was fined for the incident involving molten sulphur. Tanker driver Jack Vickers was loading the dangerous substance from his vehicle and was detaching the lance from a loading arm when he slipped. After pulling his leg out of the 140 degree molten sulphur, Mr Vickers needed extensive skin grafts. The Health and Safety Executive told the court that there were no safety practices in place concerning the manway, and potential hazards had not been identified and dealt with. Total Lindsey Oil Refinery, was fined £20,000 and ordered to pay £2,641 in costs with a victim surcharge of £120. HSE inspector Jayne Towey said: "Mr Vickers sustained extremely painful injuries, which still affect him now. Yet this incident could have been avoided if Total had identified the dangers associated with attaching and detaching the loading lance and then taken action to reduce those risks. "Loading molten sulphur is a common task within the refining industry. Total had two other loading units on site with a different system whereby a loading lance does not have to be attached to the loading arm." Hundreds are briefly told to stay indoors after a sulfuric acid leak in Anne Arundel County. It happened around 9 a.m. Saturday in the 3500 block of Whiskey Bottom Road in Maryland City. Police say a hazmat team was called after a 45-foot trailer delivering totes of sulfuric acid leaked. A bulk carrier loaded with a cargo of sulfur ran aground offshore Port Arthur, Texas, on Wednesday. Jian Qiang (46,807 dwt, built 1996), owned by China’s Cosco, was outward bound from Neches Industrial park in Beaumont, Texas, when it ran hard aground. US Coast Guard (USCG) responded to a call at approximately 1.30pm and were quickly on the scene. They were co-ordinating with the ship’s owners, the Texas General Land Office and the Texas Commission on Environmental Quality to find a way to release the vessel. The 615-foot ship was still stuck as of late Wednesday night but there were no significant reports of damage, injury or pollution. USCG are investigating the cause of the accident. 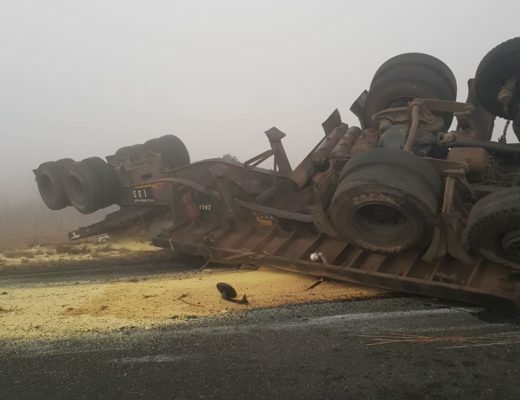 Spill May 21, 2015 Modimolle, South Africa Police are investigating a case against officials who responded to the accident scene where a truck carrying sulphuric acid overturned on Saturday, May 16. The truck carrying 28,000 litres of sulphuric acid was on its way to Zimbabwe. DA leader for Limpopo, Jacques Smalle claims that the disaster management units arrived at the scene four hours after the toxic spill. CCTV footage in the video above shows how disaster management officials then proceeded to clean up the spill by using water from a fire department truck to spray the acid into the Nyl River. The DA has laid criminal charges against the heads of disaster management of the Modimolle and Waterberg municipalities, and the Waterberg fire chief for not complying with regulations in section 28 of the National Environment Act of 1998. The environmental damage to the river has been extensive as locals have been warned not to drink the water or use it for farming. Fish in the river have died and the national Department of Water Affairs and Sanitation has described the pollution as "very serious". The pollution has been neutralised with a treatment of lime, to reduce the level of acidity, but further treatment is still needed. Warrant officer James Findlay, spokesperson for the Modimolle police, said the charges laid are specifically “failure to comply with directive to cease activity and to rehabilitate the environment /contravene and fail to comply with conditions of the authorisation”. Affidavits have not yet been obtained, said Findlay. “The investigating officer will obtain statements from the three involved early next week.” Findlay says this is an unusual case for Modimolle police. “I’ve been here over 20 years and if I’m not mistaken most of our big truck accidents, like with petrol trucks, happen on the highway and don’t go into the water,” he said. Smalle told eNCA.com that they are relieved that the national water affairs department is dealing with the issue. However, the DA plans to watch the clean-up process closely. “We will compile a comprehensive analysis report and present it at the Limpopo legislature so we can monitor ongoing process,” said Smalle. Modimolle farmers in Limpopo have suspended farming activities after a sulphuric acid spill contaminated the Nyl River last weekend.A truck carrying sulphuric acid overturned in the town and acid spilled into the river. Water Affairs officials are busy with clean-up operations. The Nyl River is the source of water for farmers in the Modimolle area. Water Affairs officials were busy working where the truck overturned at corner Thabo Mbeki and Nelson Mandela Streets last weekend. They were using wheelbarrows to carry lime to the river to neutralise the acid. The scene was cordoned off. Officials refused to talk about the clean-up operations and referred all enquiries to their National Office. Modimolle farmers are blaming the Waterberg District Municipality for the incident. Local farmer Johan Abrie says they have suspended all ploughing activities. Fish and other water species have died. Abrie alleges that the municipality did not prevent the acid from spilling into the river. "Sulphuric acid spilled onto a tar road, what happened is instead of covering it and building a buffer zone so it cannot enter the river, the municipality, against every law in the book, took hoses to wash down into the Nyl River. That is the most inhumanly possible thing they could have done. So instead of following international regulations and protocol how to treat this thing, the municipality decided to wash it into the river." Waterberg District Municipal Manager, Sam Mabotja says the spill is a Water Affairs matter. The Water Affairs Department could not be reached for comment. Meanwhile, retired Zoologist, Professor Koos Prinsloo, says the sulphuric acid that polluted the Nyl River is a danger to environment and its natural species. He says delays in treating the polluted water will have negative effects on the ecological system. "Sulphuric acid is difficult chemical it comes in contact with water certain reaction start take place. Some very serious toxic substances are formed. It is definitely affecting the plants, it is going to affect millions of macrobiotic in the water that play a very important role in keeping ecological balance." More than 300 gallons of sulphuric acid were spilled in an accident at a power plant in Montgomery County on Wednesday, injuring one worker. County fire and rescue service spokesman Pete Piringer said that the worker was not seriously injured and had been decontaminated after the acid splashed onto him. Piringer said that workers were moving a container of the acid at a loading dock at an energy substation on Martinsburg Road in Dickerson. They accidentally spilled the caustic substance, he said. BC Eight train cars carrying sulphur derailed near Mackenzie on a railway crossing Highway 97 South at about 8:30 p.m. Sunday night, a Canadian National Rail Co. spokesperson has confirmed.Drive BC has indicated that Highway 97 will be blocked in both directions until further notice near Bijoux Falls Provincial Park.There were no injuries reported and the cause of the derailment is under investigation, CN said.Pierre Boivin, senior manager of stakeholder relations with CN Rail, told the Alaska Highway News Sunday night that the eight cars involved in the derailment were all carrying sulphur. 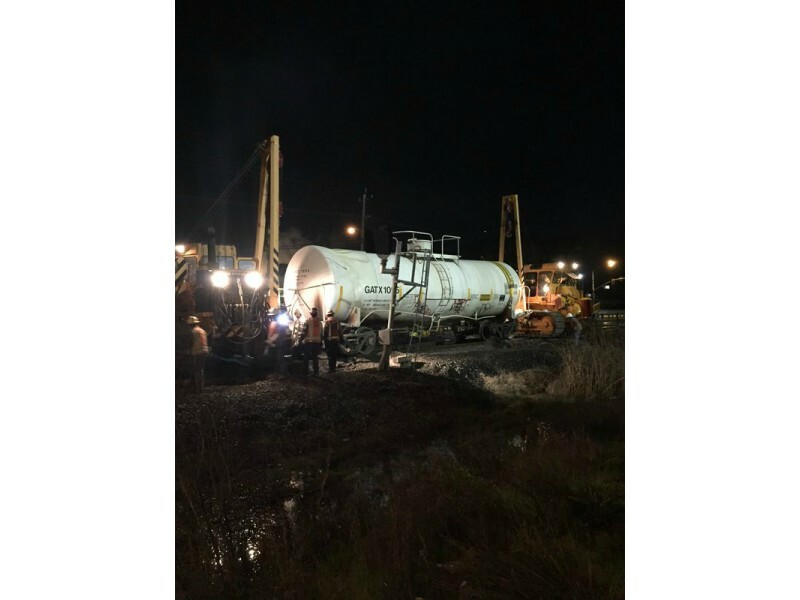 "The cars are upright and there are no indications that there is any spill or any environmental impacts," Boivin said.CN crews will work through the night to clear the crossing "as soon as possible," Boivin added, but he did not know how long it would take. "At this point all we know is that Highway 97 is blocked," Boivin explained. "Our crews are en route. As soon as they arrive they are going to work to clear the crossing. "It's unclear at this time where the train originated from, or where it was headed. About 22 homes were evacuated from a north Birmingham neighborhood while crews moved a semi-truck carrying hazardous material that got stuck around midnight. 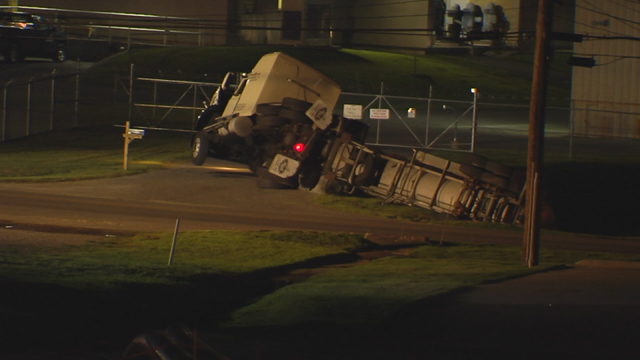 The semi-truck, which was carrying 3,000 gallons of sulfuric acie, was trying to navigate through a neighborhood when it hit a curve and jackknifed on a narrow street around midnight, according to EMA officials. Police blocked off the area and evacuated people in the Fairmont community on 40th Avenue North near Lewisburg Road, off of Daniel Payne Drive and near Carver High School. Birmingham police told residents that if the sulfuric acid mixed with water, it could possibly blow up. A hazmat crew with Birmingham Fire Department responded to the scene as a precaution. None of the sulfuric acid has spilled from the truck, according to Jody Hodge with the Jefferson County EMA. He says the truck driver is also OK and no one was injured. The truck was turned upright and moved from the area where it got stuck by 8 a.m. Residents who were evacuated say this isn't the first time a semi-truck has been stuck in their neighborhood. “No it's not, it's happened before, we didn't have to be evacuated, they were able to get the truck up, but semis come through here all the time and turn over,” Sophia Holloway said. “We've gone to talk to different people about getting some assistance with stopping these trucks from coming through here. We don't want this to happen. We don't want this neighborhood to blow up because of this type situation,” Holloway added. Holloway explained that the semi-trucks often miss their exit off 41st Avenue and go to Fultondale to turn around, and the GPS routes the trucks through her neighborhood. “Once they turn around, they come through the neighborhoods and there's really no room for them to maneuver in there,” she said. Hodge said he believed the truck driver was trying to get to a truck stop in the area and the GPS took him a roundabout way. He said the driver turned on a narrow street and jackknifed. “Some of these streets are very narrow, have sharp curves, and you know, with an 18-wheeler, it just happened," Hodge said. He said about 10 families chose to not evacuate and shelter in place. The Red Cross had a shelter on standby, but it was never opened. Police will determine when residents are allowed to return to their homes. At the Tihoretsk station of the North Caucasus Railway in Krasnodar Territory, sulfuric acid has leaked from a holding tank, the press service of the Ministry of Emergency Measures of the Russian Federation in the region reported. The leak occurred last night about 21:20 Moscow time in the park "B" of Tikhoretsk station, Interfax cites the report. Sue Turley and Raquel Sever received a phone call Tuesday they never expected. They learned their sister's husband, Joshua Schade, had been in a terrible accident on the job. "We really don't know exactly what happened at this point," Sever said. Although the investigation is ongoing, they do know some of the details. Their brother-in-law was transporting sulfuric acid for Basin Western Trucking Company to Delta on Tuesday. When he went to unload it, something went horribly wrong. "It poured all the way down his body, from his head all the way down," Turley said. They said first responders took him to a hospital for decontamination, then he was flown to University Hospital's burn center. Schade has already undergone one skin graft surgery with more planned. "They keep reminding (my sister) he's in very critical condition and they don't want to give her the impression that he's definitely going to make it home," Turley said. Turley said Schade began the job only a few weeks ago and was excited because the schedule allowed him to spend more time with his family. Now they're hoping the 29-year-old father will get that time. "We're just trying to be hopeful and have faith that he'll make it," Sever said. "My sister has said so many times she doesn't care what he looks like," added Turley. "She doesn't want him in pain, and she just wants to have her husband." "Everyone is hoping and praying for Josh and his family at this time," said Lloyd Dean, a spokesman for Western Basin Trucking Company. Dean said the company is conducting its own investigation to determine what happened. Days after leakage of sulphur dioxide caused suffocation to workers and people residing in the area, Tamil Nadu Chemical Products Ltd, a factory manufacturing dyeing substance, in Kovilur was today ordered to be closed down by the state pollution control board. Three school children had fainted upon inhaling sulphur dioxide from the factory on February 12. The leak also caused suffocation to factory workers and people living around. On inspection of the 35-year-old factory, officials of the Tamil Nadu Pollution Control Board found that main units had not been maintained properly leading to the gas leakage. The chairman of the board ordered closure of the factory, the officials said. 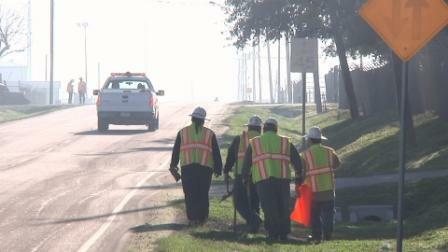 Crews were busy cleaning up a sulfur pellet spill Tuesday morning. It happened in the area of Suntide and Up River Road. 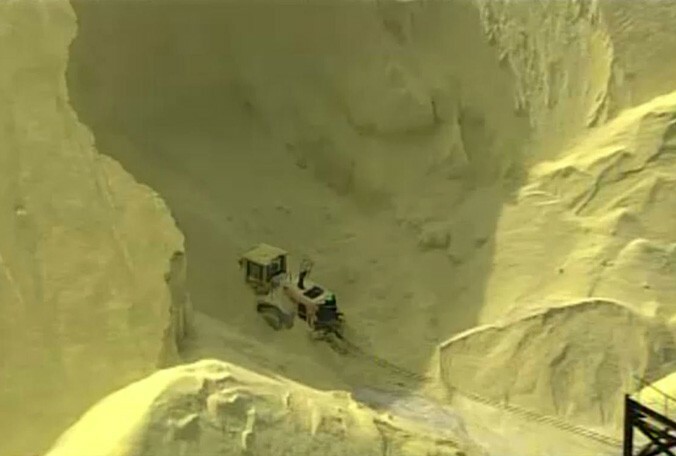 A private contractor was taking prilled sulfur from the Flint Hills West Plant to the bulk terminal, when a portion of the load spilled from the truck onto the roadway. According to a spokeswoman from Flint Hills, clean-up crews were called in to sweep up the material. Because the sulphur was in pellet form, it was not hazardous and no streets had to be closed. The chemical is commonly stored outdoors and is used in fertilizer. PEOPLE who depend on Chililabombwe’s Lubengele stream for water have been left stranded after a tanker delivering sulphuric acid to KCM overturned on Friday, spilling its contents into the stream. Chililabombwe Municipal Council health inspectors confirmed the development. “Lubengele Stream is important because many families get their water from there. This is a serious threat and something must be done before the whole stream is contaminated,” the officers warned. The inspectors said Mulonga Water and Sewerage Company obtained water samples to determine the amount of acid in the stream. They said immediate measures had been put in place to stop the spillage but that the council and Mulonga Water would carry out further investigations. And Abrahman Yessus, the owner of the tanker, explained that the driver failed to control the vehicle which fell on the road, causing the spillage. “Around 06:00 hours, I received a call that my tanker carrying sulphuric acid for delivery at KCM had an accident. What happened was that the driver lost control because he was going uphill and the tanker fell on the road. There are no injuries and with the help of KCM, we have managed to control the sulphuric acid by putting lime,” said Yessus. 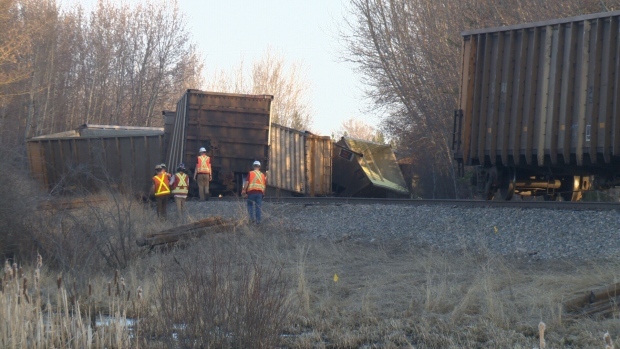 A train derailment in Richmond Hill has closed Elgin Mills East Road between Yonge Street and Newkirk Road. Two cars on a southbound CN Rail train partially derailed at around noon on Saturday according to CN and York Regional Police. One was carrying steel, the other was carrying sulphuric acid. No one was injured and no material leaked, officials said. The cause is under investigation. 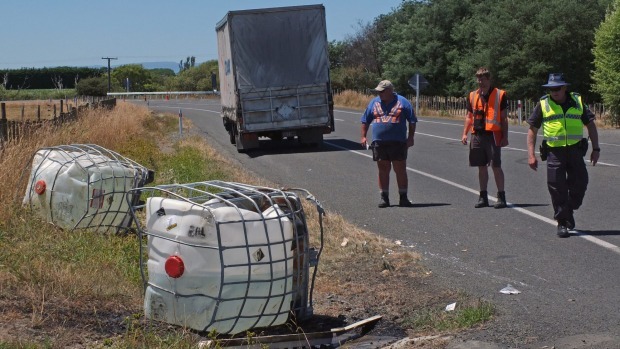 A truck has spilled 500 litres of toxic acid near Feilding today. The truck lost its load of sulfuric acid on Awahuri-Feilding road about 12.15pm, and roadblocks were put up while the chemical was cleared. Greg Bevin, Horizons team leader consent monitoring, said the acid was at 70 per cent concentration. It was contained in a dry roadside drain and there was no threat to waterways or public safety, he said. A Horizon's environmental protection officer was assisting the Fire Service. A tanker carrying 48,000 gallons of sulfuric acid overturned on Interstate 24 near mile marker 23 on the eastbound side, according to the Tennessee Highway Patrol. The accident happened at about 11 a.m. on Wednesday. One eastbound lane has been reopened, according to dispatch. Westbound traffic remains unaffected. The Tennessee Department of Transportation doesn't expect the wreck to be cleared until 5 p.m. The driver has been identified as Calvin L. Morgan, 67, of Turtletown. He was injured in the wreck, but was not taken to the hospital, according to the preliminary THP report. Morgan was driving eastbound on I-24 when his truck's left front tire exited the roadway into the median. He overcorrected and lost control of the vehicle. The trailer disconnected from the truck and came to rest in the median. The truck crossed both lanes of eastbound traffic and crashed into several trees along the right shoulder, according to the report. Hazmat crews were dispatched to the scene when the call came in, dispatch confirmed. None of the acid was spilled in the accident, according to THP. Morgan was charged with having an expired medical card and other charges are pending, authorities say.